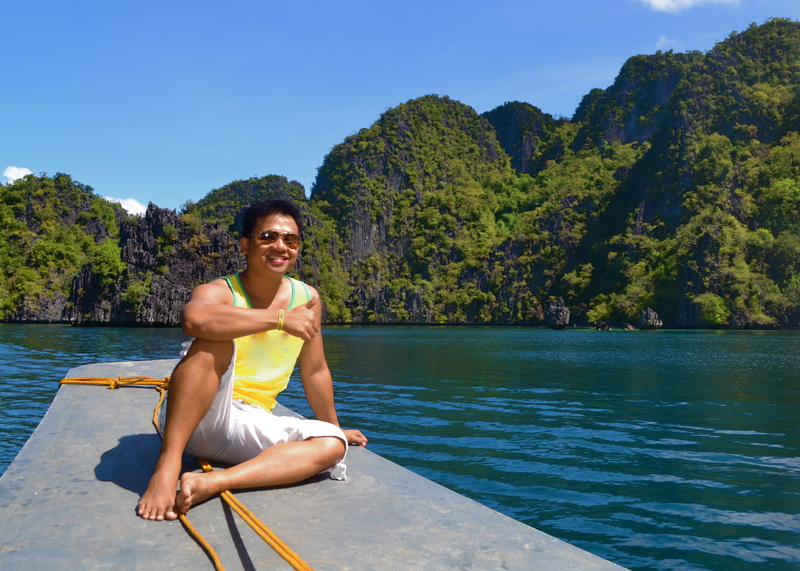 My one year off from corporate life enabled me to embark on a traveling spree in the Philippines, my home country, and beyond. 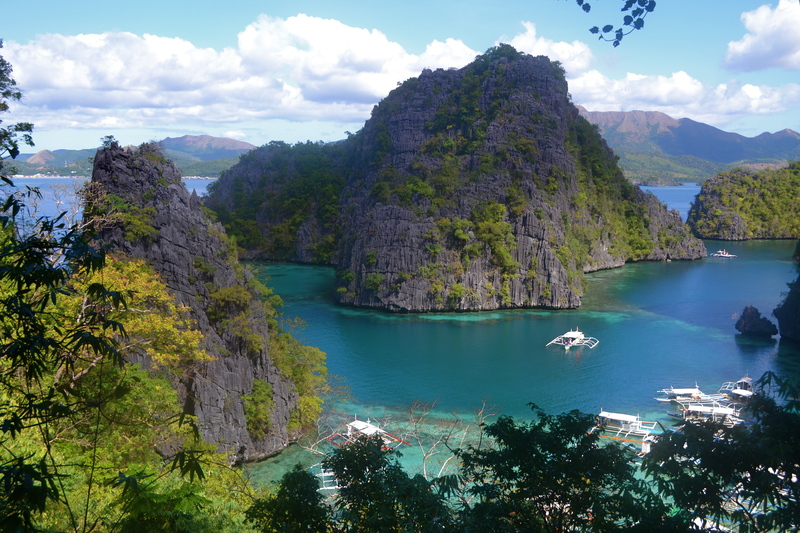 It was already almost ending and I was resolute not to commit a major miss out not to include Palawan in one of my itineraries. 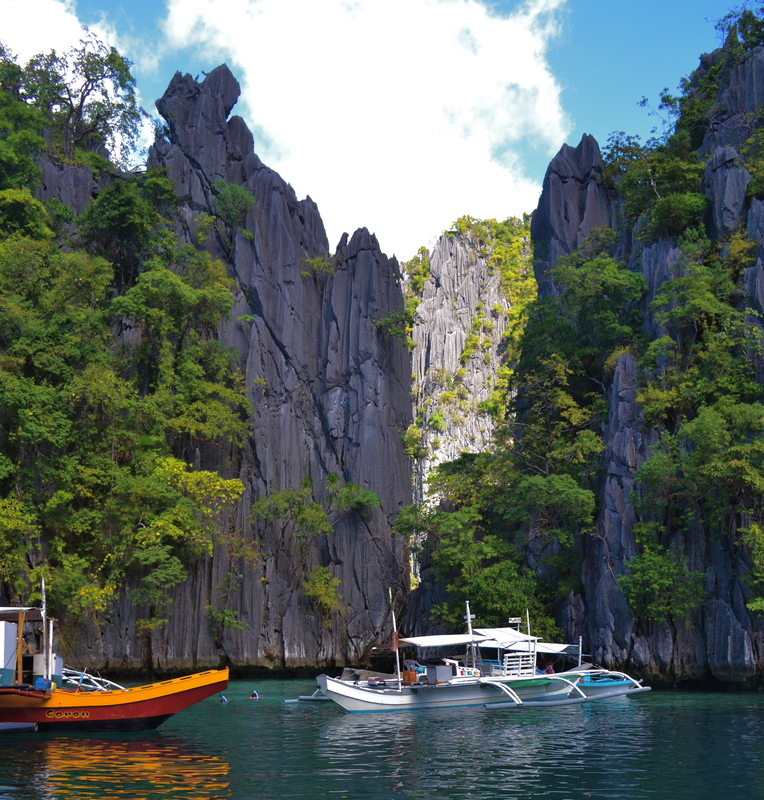 Called as the Philippine’s “Last Frontier”, Palawan is oozing with unique & diverse natural beauty, probably unmatched anywhere in the world! 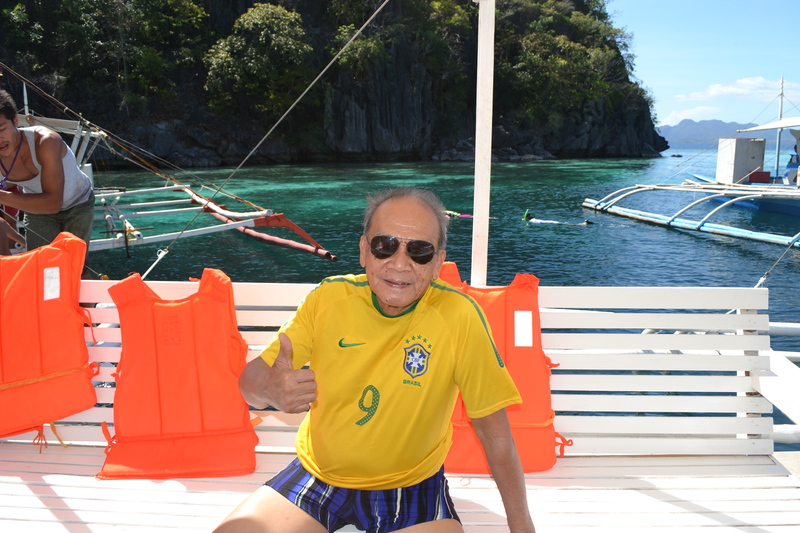 I have decided to visit Coron, a part of the Calamian group of islands in the north, which is one of the three popular tourist areas in Palawan. 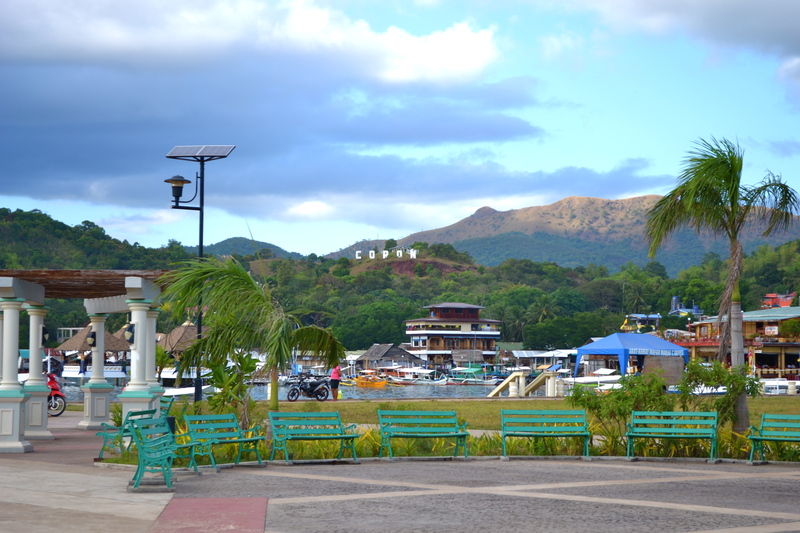 The other two are the capital Puerto Princesa (City) in the mid south and El Nido town area in the upper north between Coron and Puerto Princesa. 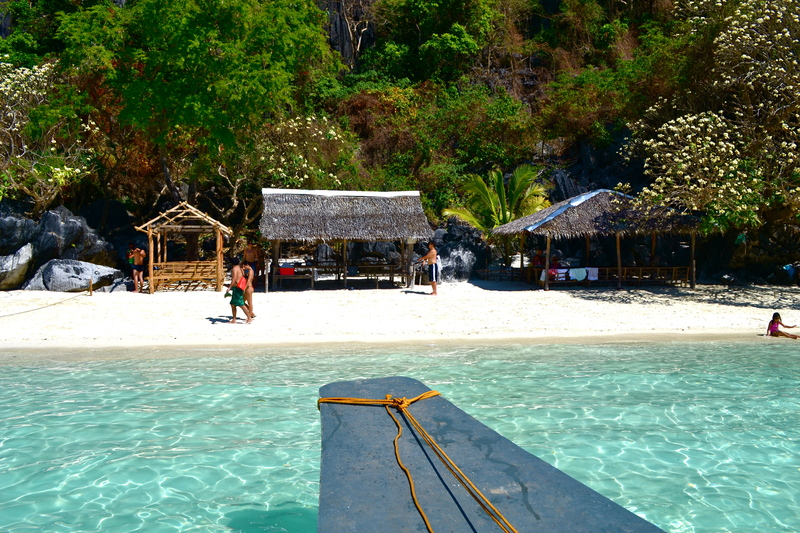 We took a one-hour flight from Manila to Busuanga airport. 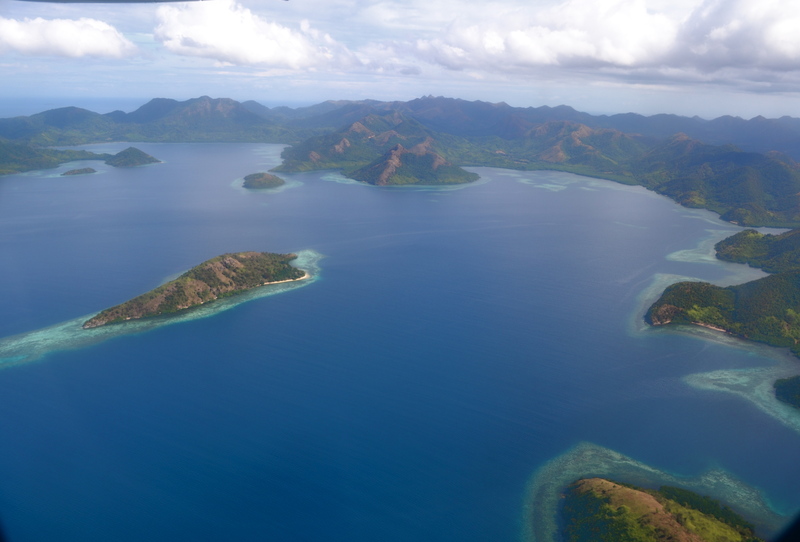 This was actually one of the few touchdowns I would always remember that I was on the verge of crying, seeing the beauty of the entire area when we were still hovering above it as we were about to land. 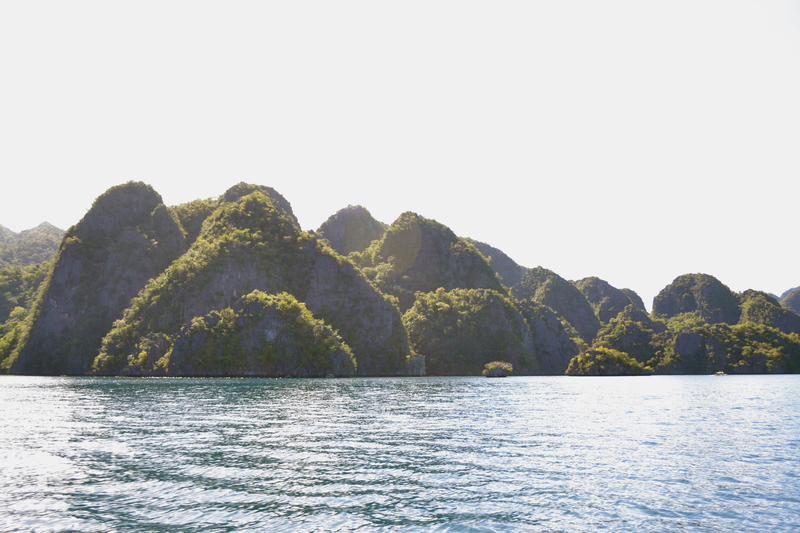 I could saw secluded islands like this only in the internet, TV and magazines. 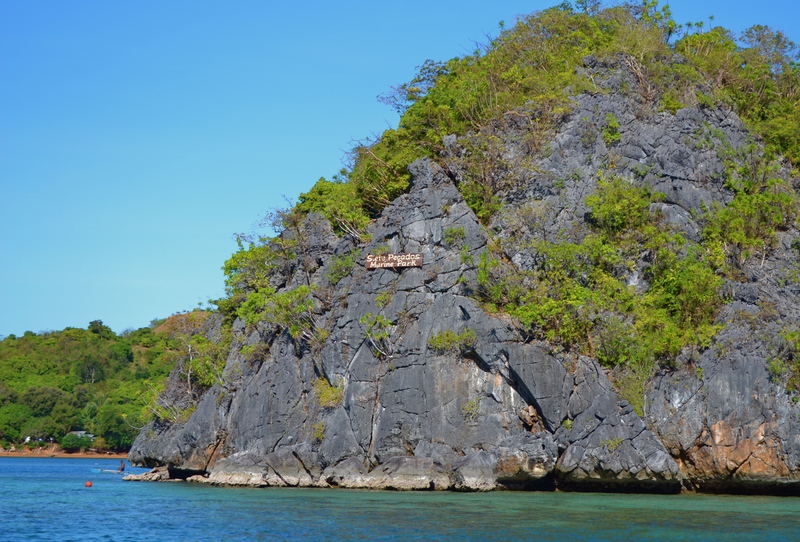 It was a real treat to have a vantage point to view one of the many outlying islets from the top. 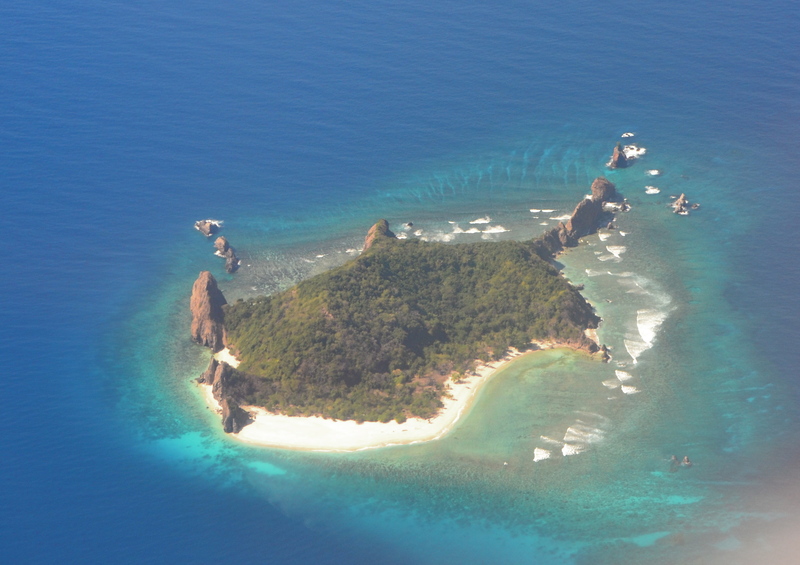 This island is Dumanpalit Island. 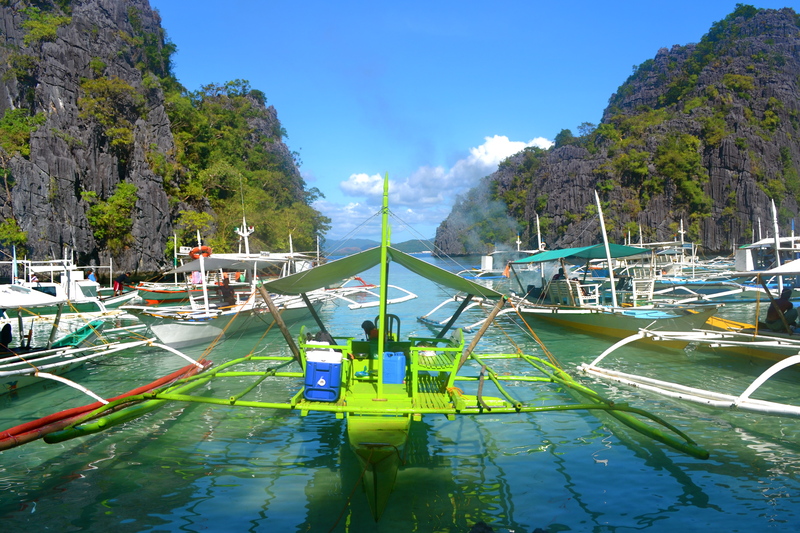 Having seen the surrounding areas gave me that ecstatic feeling that I would be landing for the first time in one of the Philippines’ rising tourist destinations. 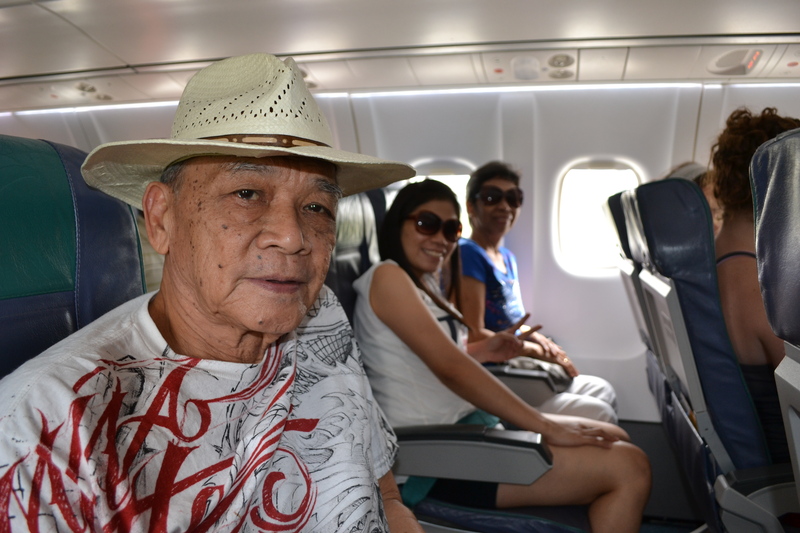 I was traveling with my 74-year old father, 69-year old mother and my 34-year old sister (one of 8 siblings I have). 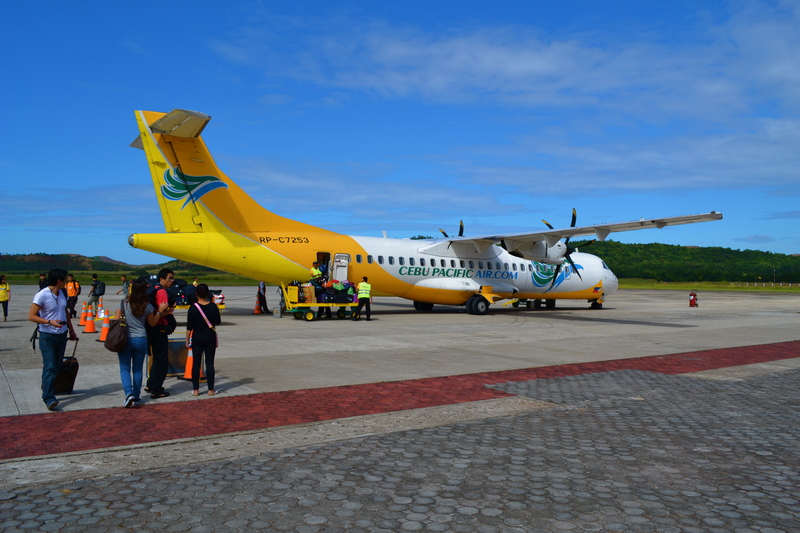 We took a Cebu Pacific Airways flight from Manila. 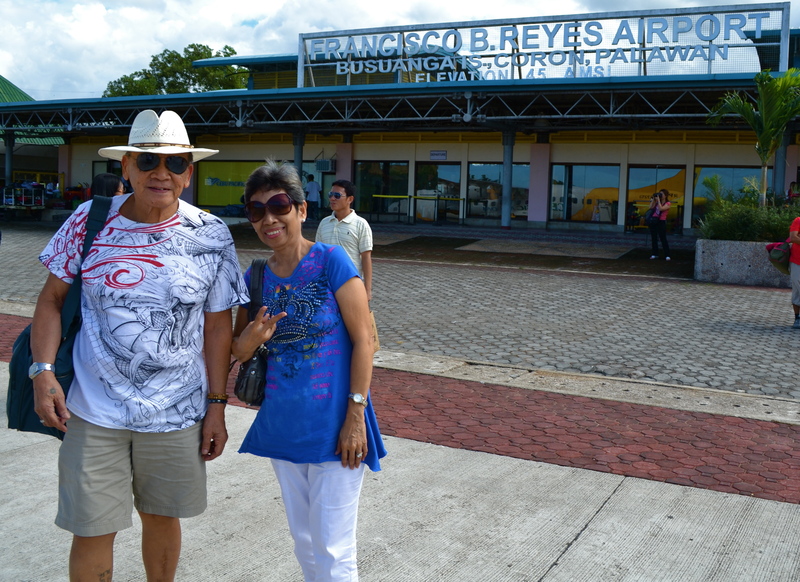 After an hour we arrived at the airport in Busuanga where we were warmly met by the driver of our arranged transport that was a part of the tour package we got from Kawayanan Tours. 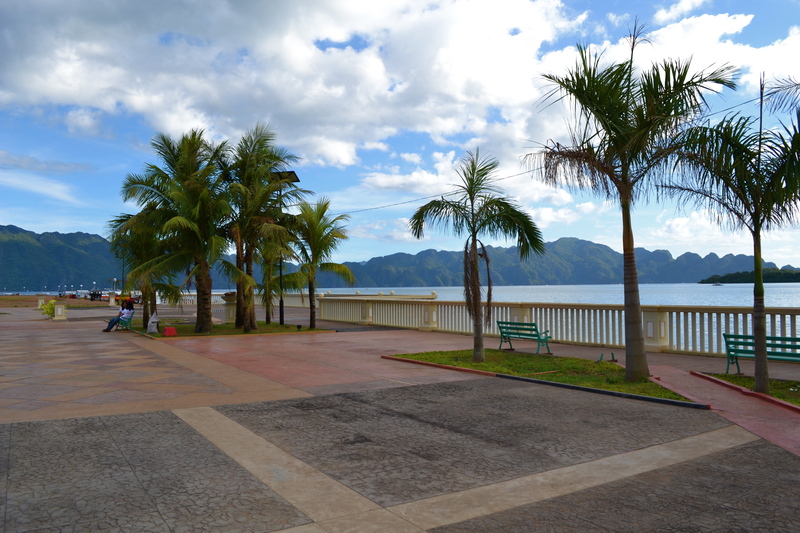 We were dropped at our hotel and 30 minutes after we started our tour of the town and some of its inland tourist spots. 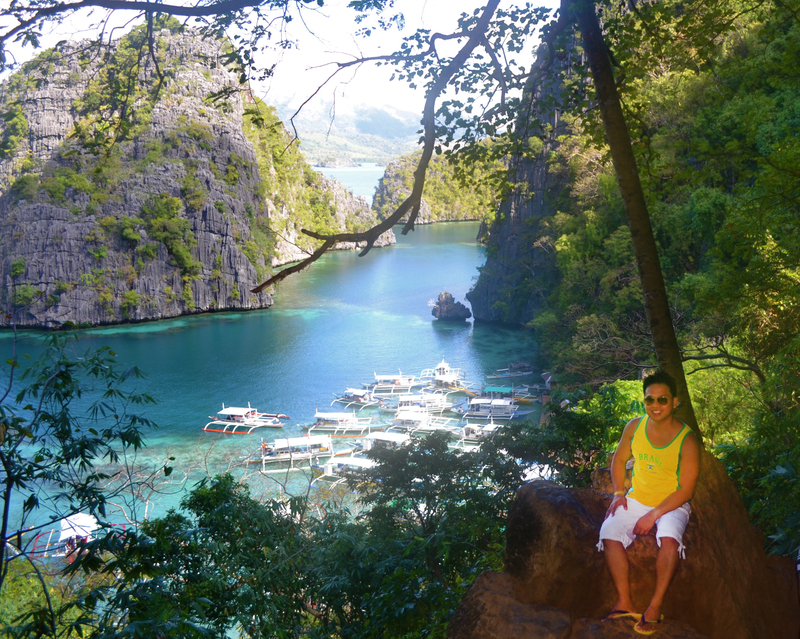 Our first stop was the ultra clean Lualhati Park overlooking Coron Bay. From the park we could also see a hill crowned with the C.O.R.O.N. letters. 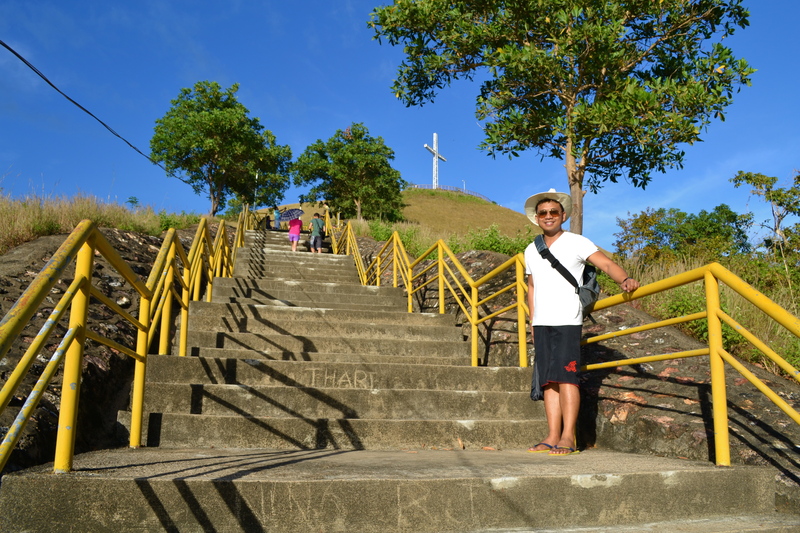 I actually requested our driver to take us to the top of the hill afterwards even though it was not part of the city tour itinerary. From the main road we walked around 5 minutes to the C.O.R.O.N. 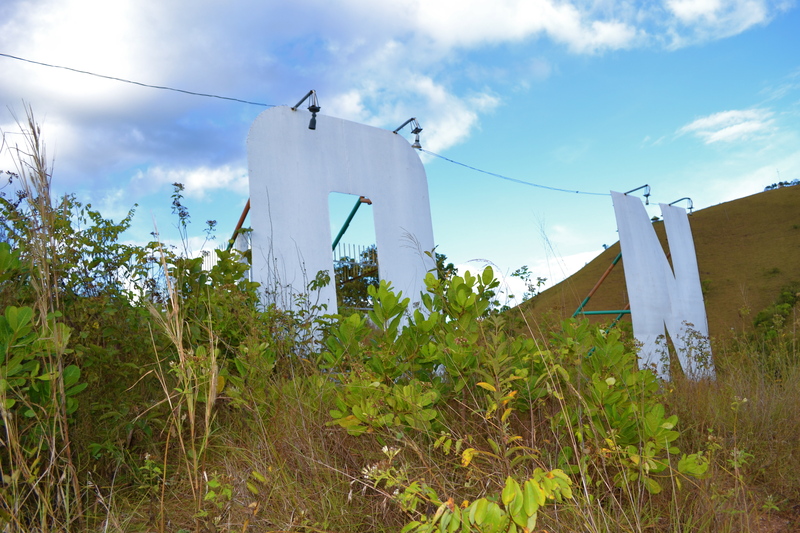 sign. 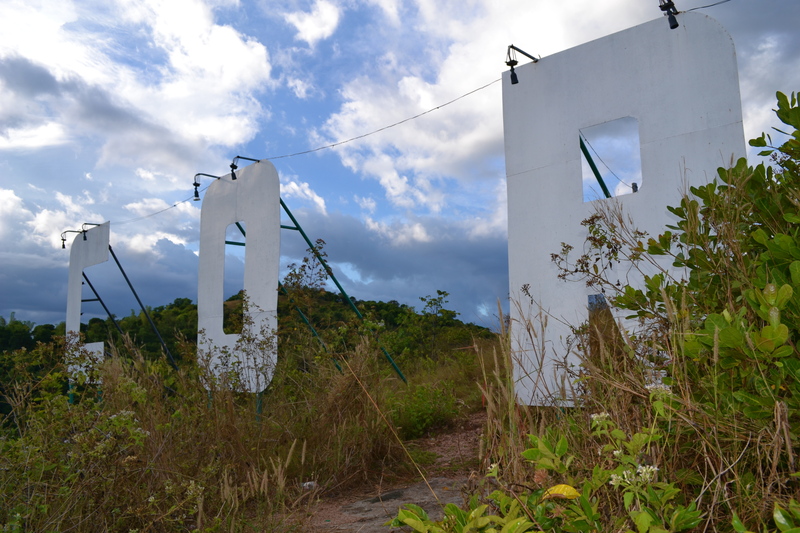 A full shot of the entire sign was impossible to take as one needed to go past the edge of the hill if a wide angle lens is not used. 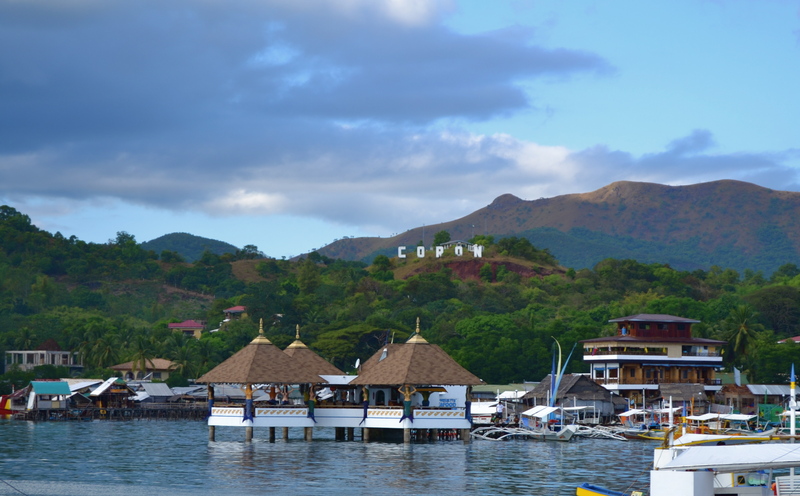 I just took a shot of the back of the sign with Coron Bay as the backdrop. A few more minutes later we stopped at the base of Mount Tapyas. 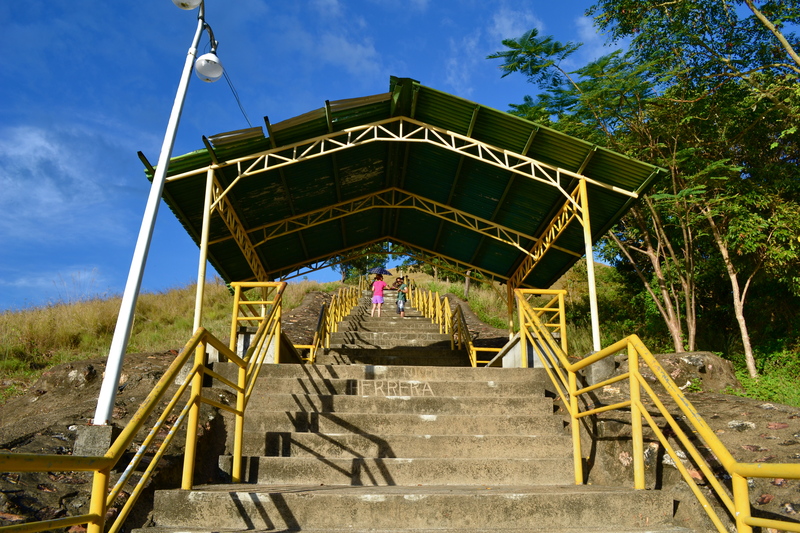 My mom did not want to try climbing the 700+ steps leading to the summit of Mount Tapyas. 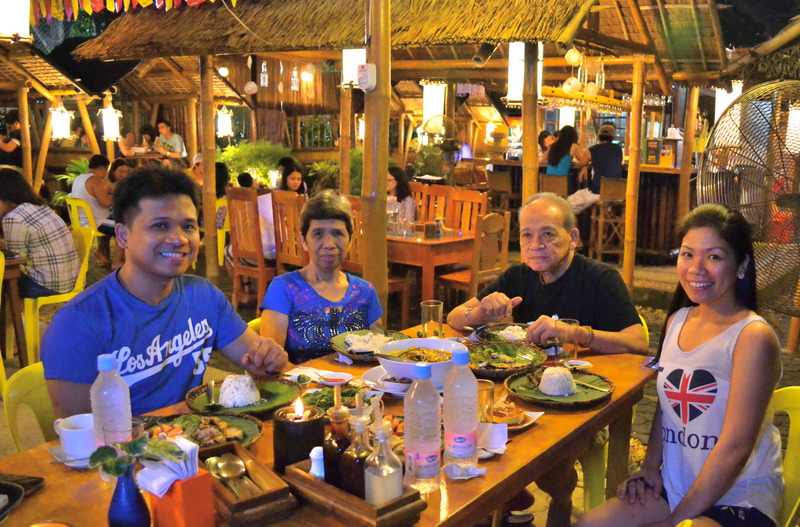 Only my father, my sister and myself did. 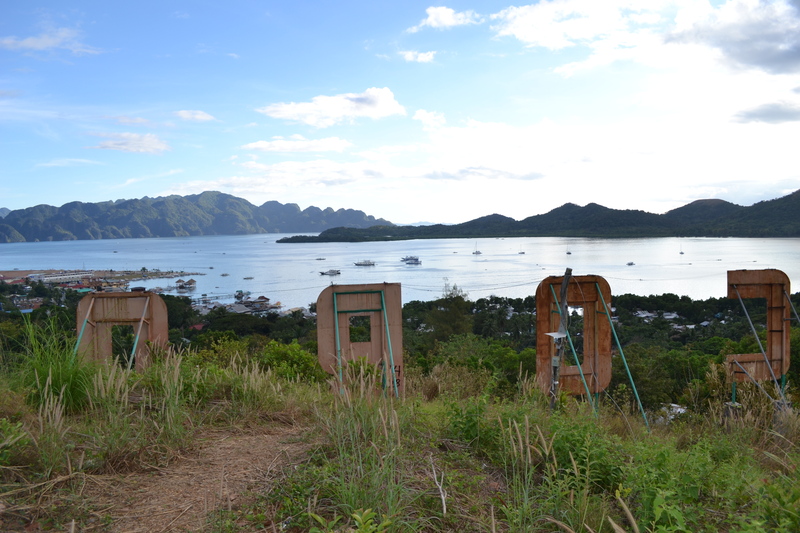 It was a scenic climb up the mountain. 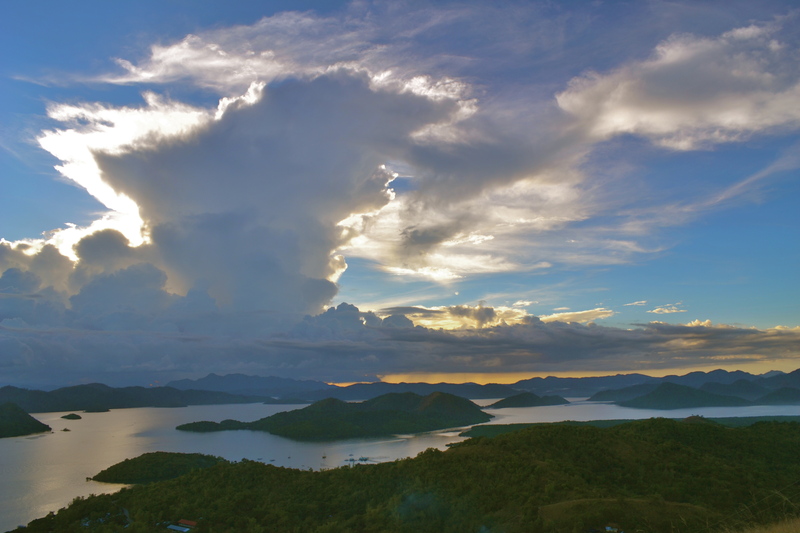 The view to the right was Coron Bay with some of the islands surrounding Coron and to the left was the town proper with the “sleeping giant”, a mass land formation that looks like a huge human figure lying down. 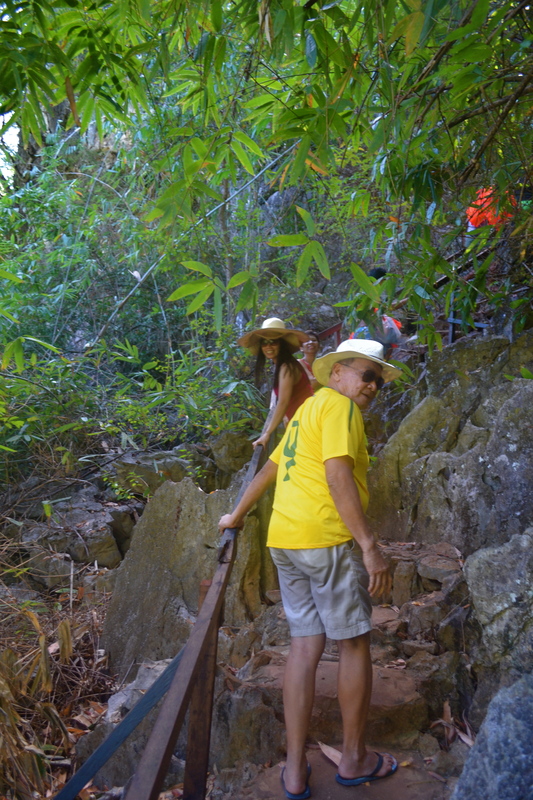 My father and sister gave up halfway through the climb. 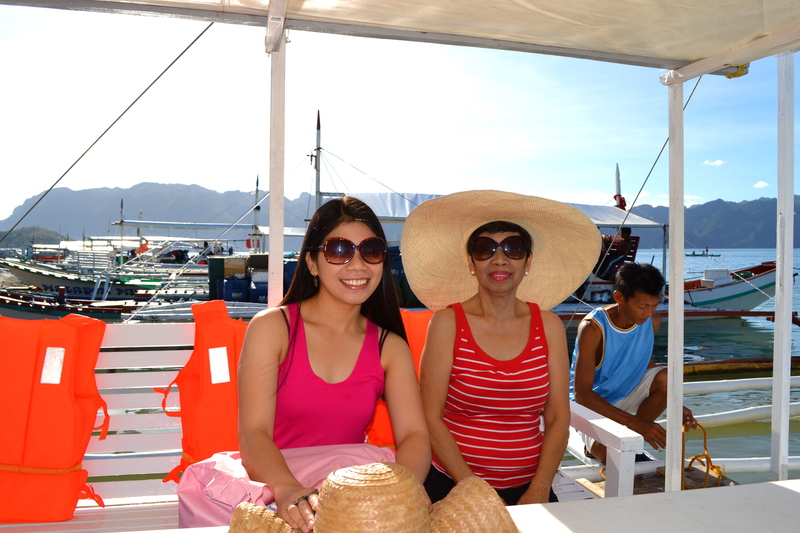 I was left alone, but not really alone as I was with my young tour guide who kept on taking my pictures. 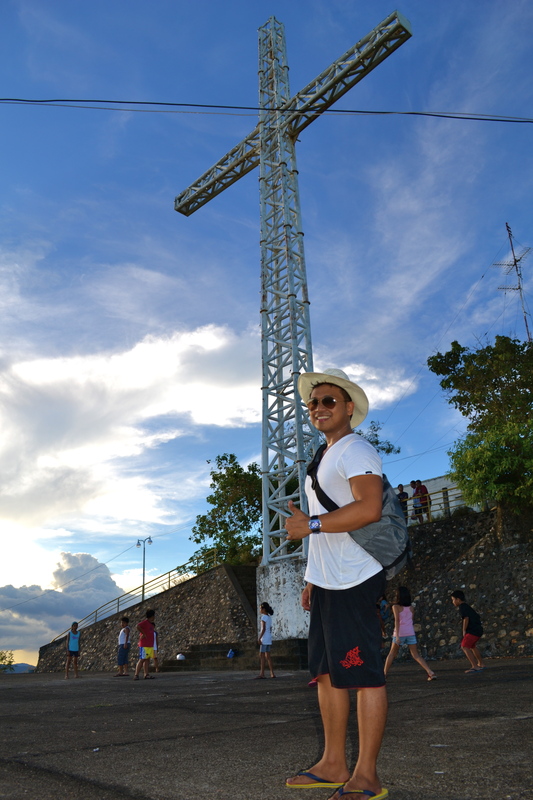 I reached the top of the mountain where the metal cross, visible from afar day and night (with lights in the evening), serving as the topmost symbol. 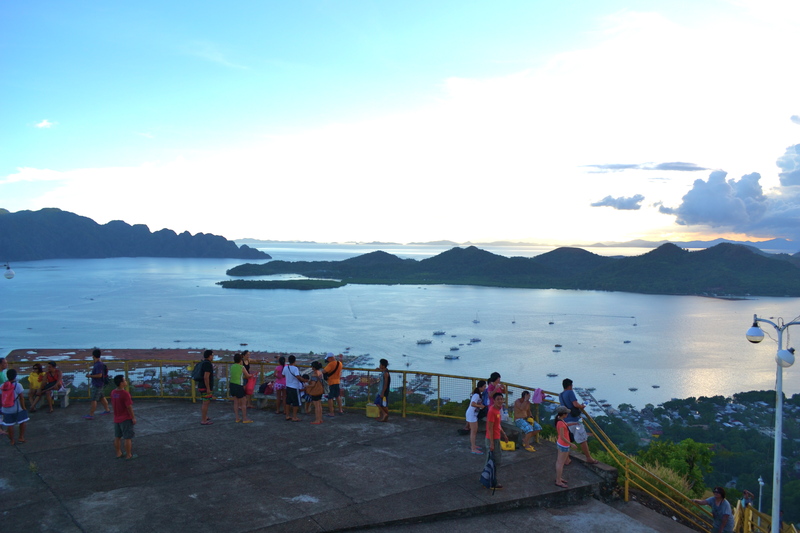 A number of local and foreign tourists were at the summit waiting for the sunset. 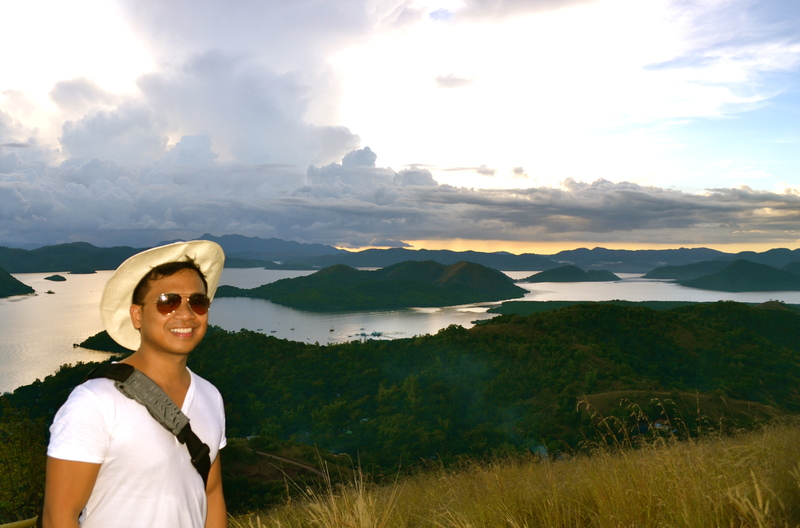 The view from the top was simply amazing with the islands surrounding Coron island creating a mythical backdrop. The sun, as it set, was partly hidden by clouds but then I was still really thankful I reached the mountain summit and we had a sunny day anyway. We went down the mountain much easier than climbing it earlier and drove off for 20 minutes to our last stop for the day. 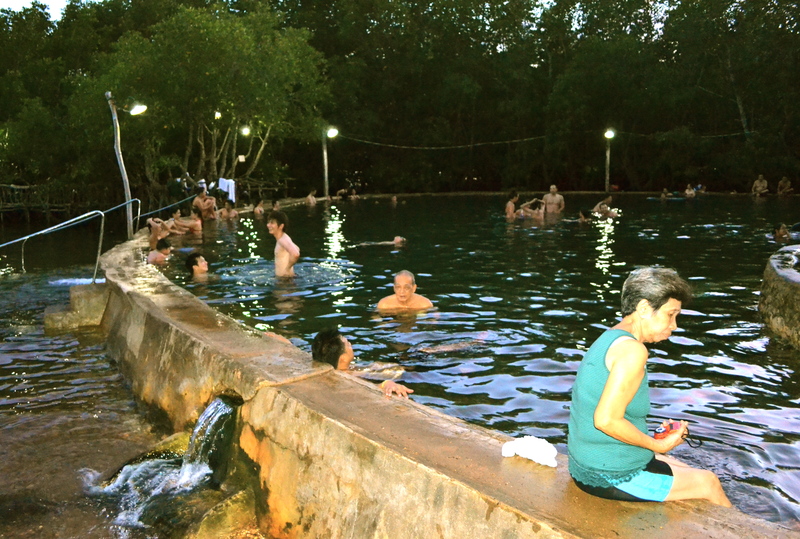 Our last stop was the Maquinit Hot Springs, a unique “salt water” hot spring. 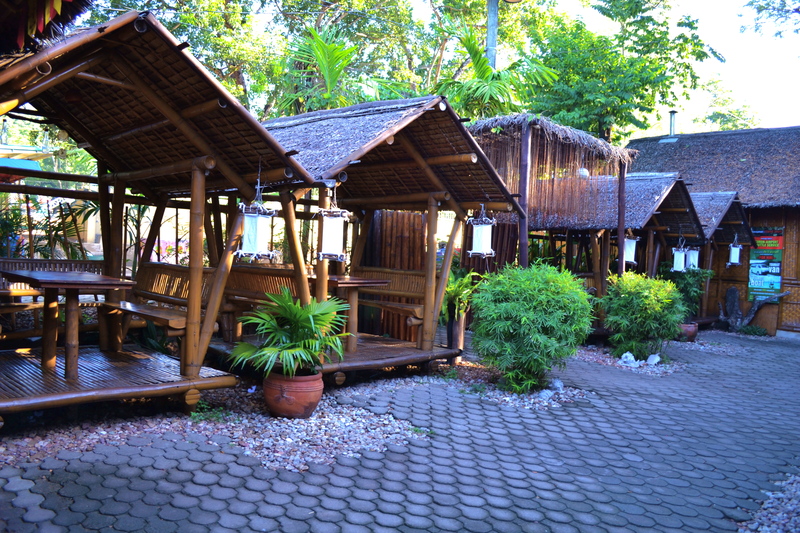 I have been to a lot of fresh water hot springs and this was the first time for me to experience a salt water hot spring. 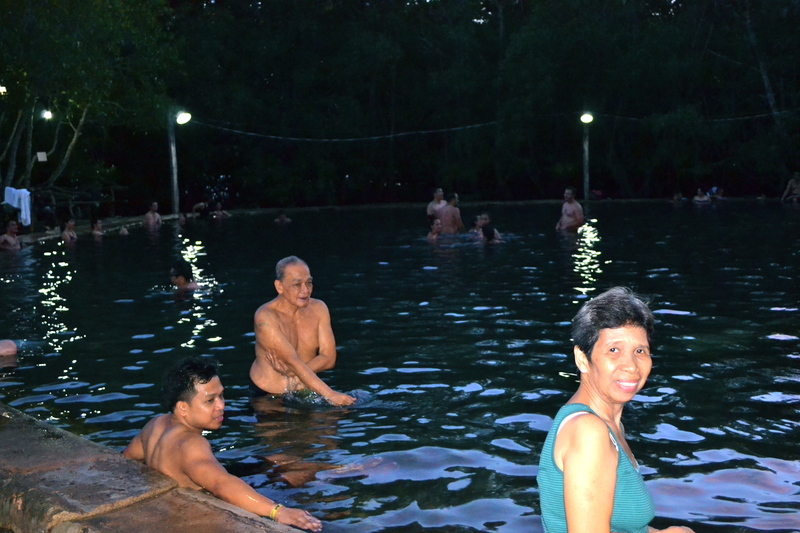 It was indeed a therapeutic immersion in the hot waters of the spring that is emptied through to the seas from the man-made pool enclosure. 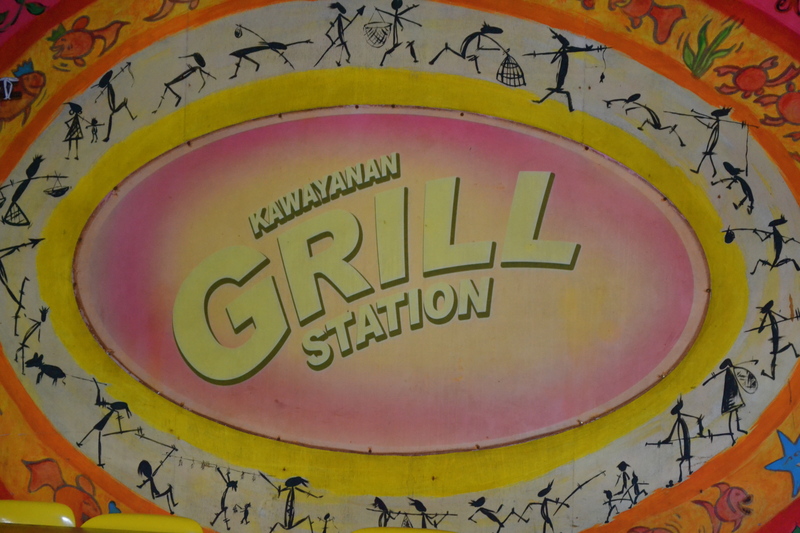 Before we returned to the hotel, we spent around 30 minutes in the pool with the water temperature reaching as high as 42 degrees C.
After freshening up, we walked to the nearby Kawayanan Grill Station, which was just a few steps from our hotel. 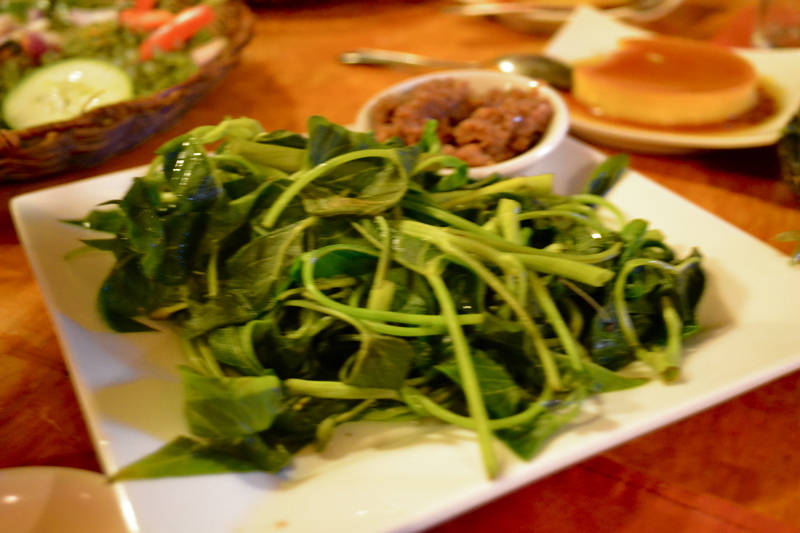 We enjoyed the food selection after the rather tiring half day city tour. 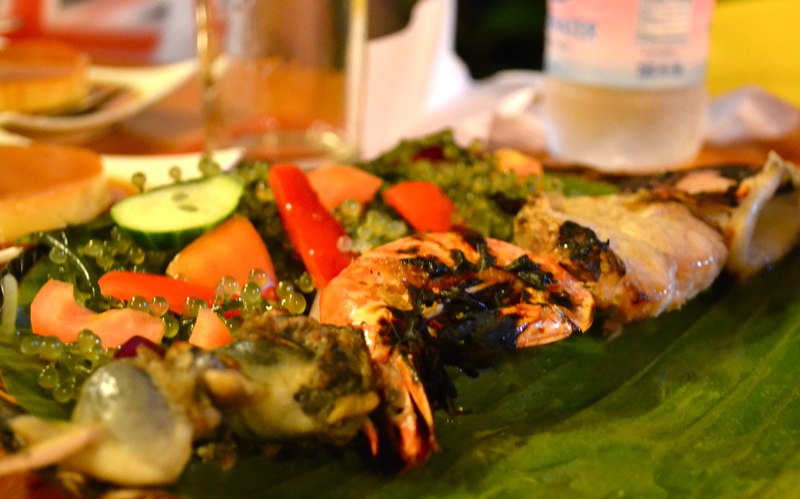 The food was absolutely delectable. 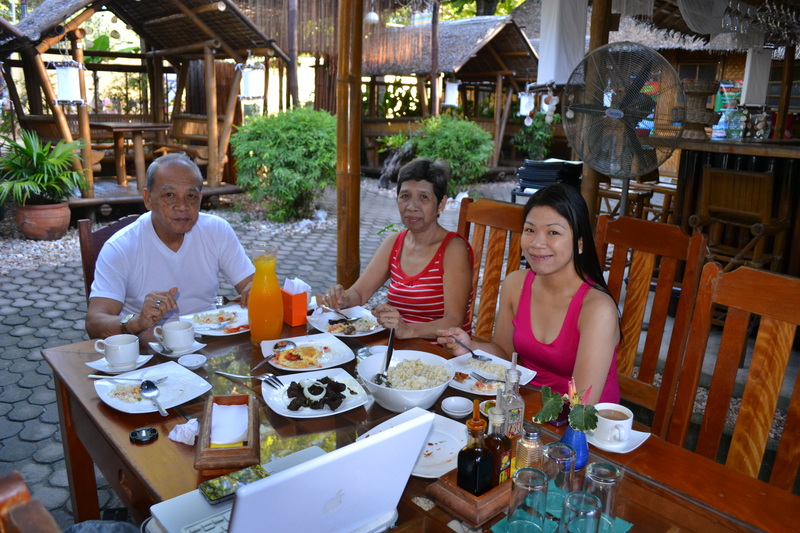 Kawayanan is one of the more famous restaurants in Coron town. 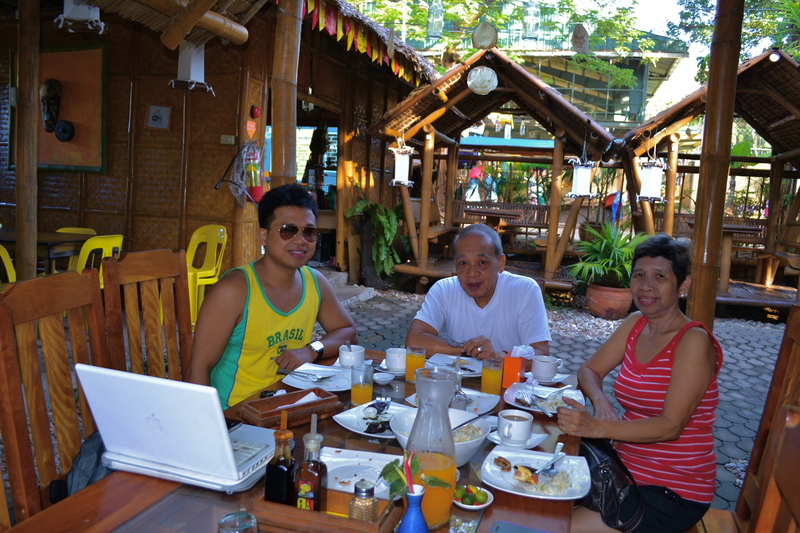 The following morning we were treated to a sumptuous breakfast of garlic rice, dried beef (tapa) and omelette still in Kawayanan Grill Station. 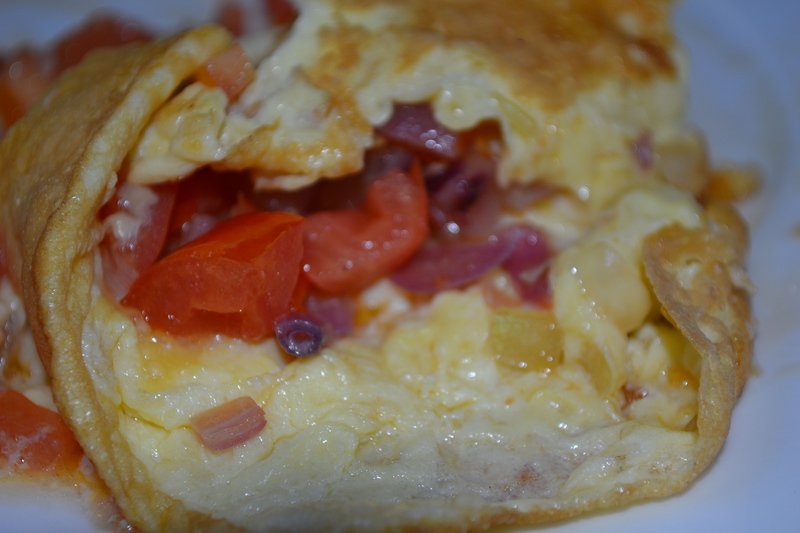 The free breakfast was part of our tour package. 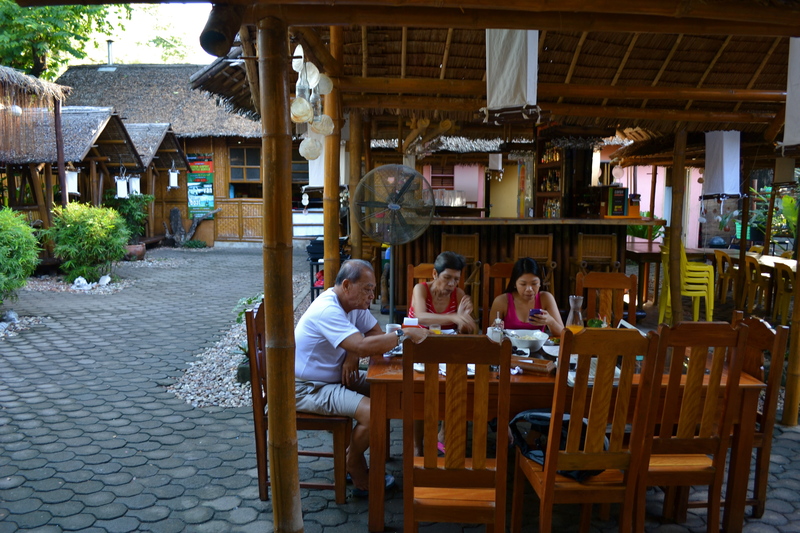 The place was still peaceful and quiet as we were the only ones dining in the place at 7a.m., after which we proceeded to our exciting day2 tour that would take us to a beach, a lake and a lagoon plus diving and snorkeling sites. 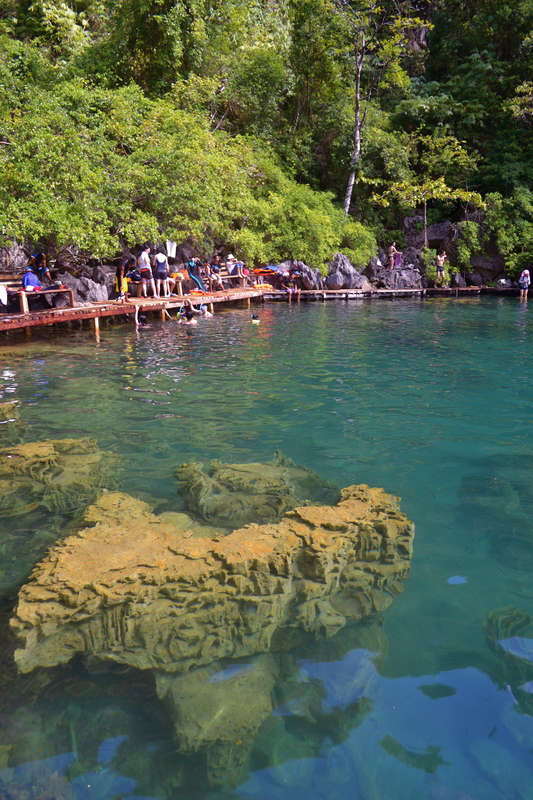 Our jump off point for the tour was the jetty off Lualhati Park. 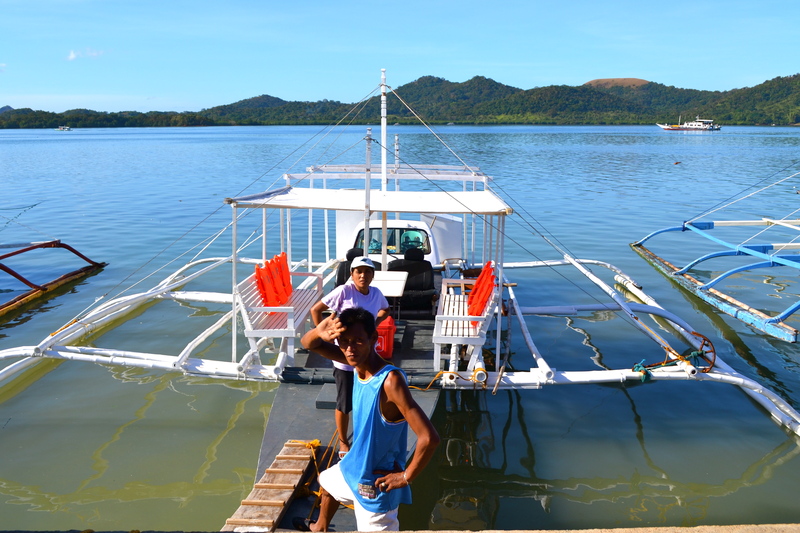 Kawayanan did want to impress us and they gave us a pretty nice boat. The red team (my sister and my mom) was ready as well as the yellow team (my father and I)! 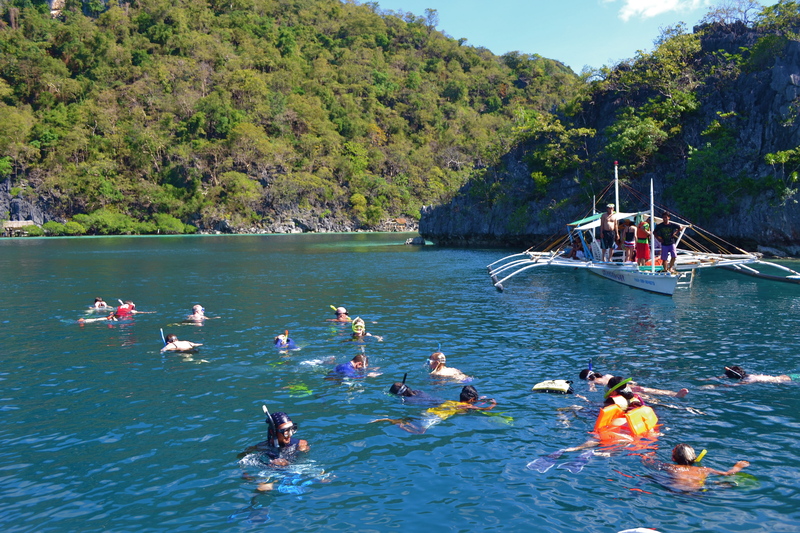 Our first main stop was the Siete Picados Marine Park, a famous snorkeling area. 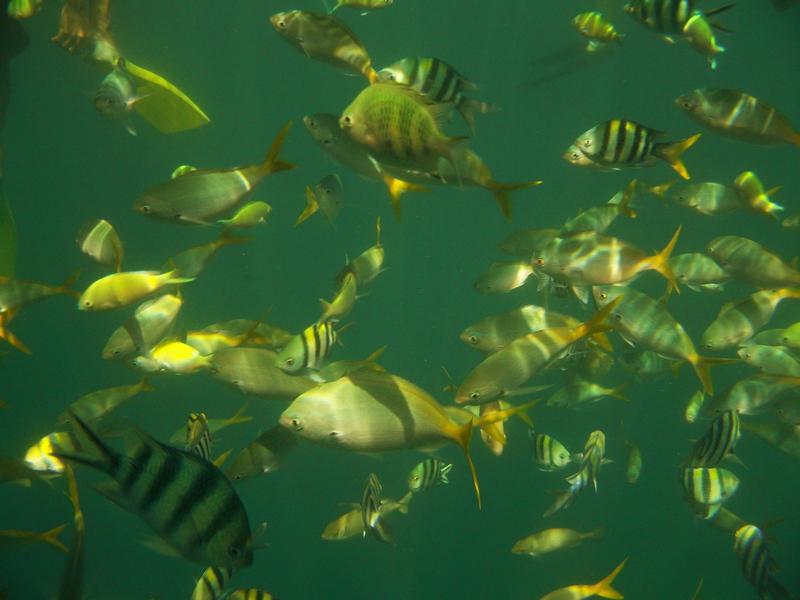 My mom was in-charged of feeding the school of fish with bread crumbs as my dad, my sister and myself jump off to the clear waters to snorkel. 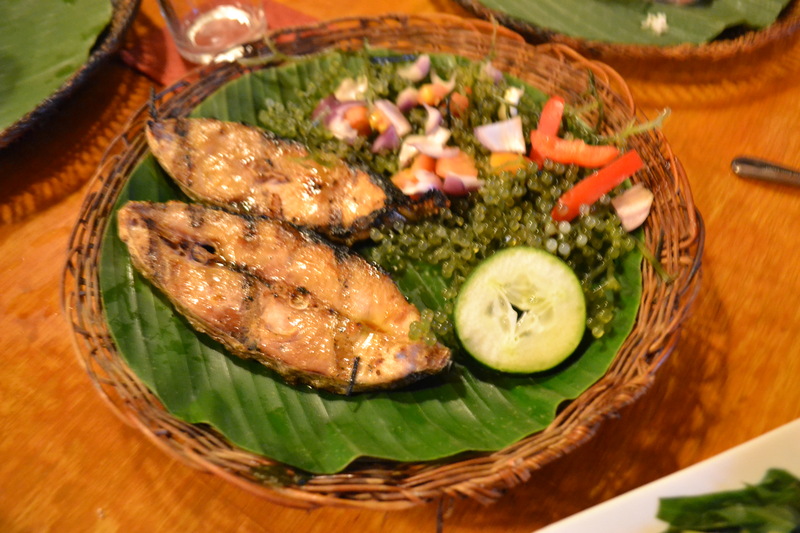 The variety of fish did not disappoint. 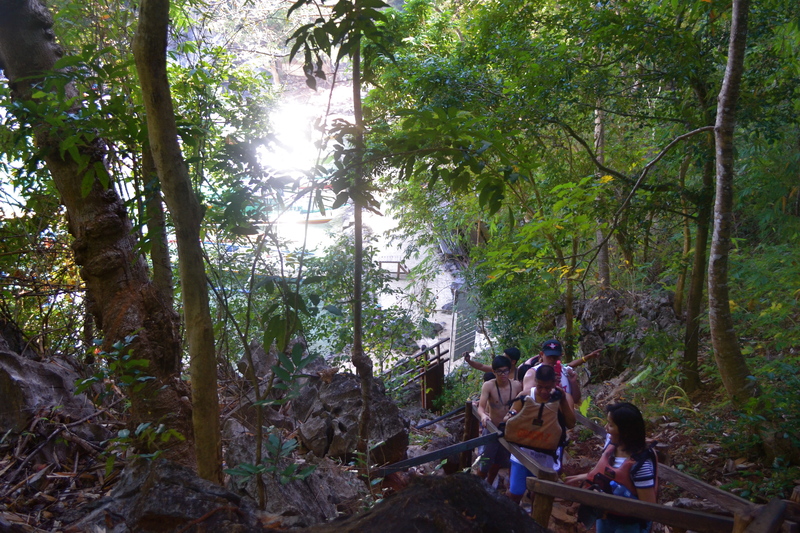 We spent around 30 minutes in the Siete Picados area and then we left. 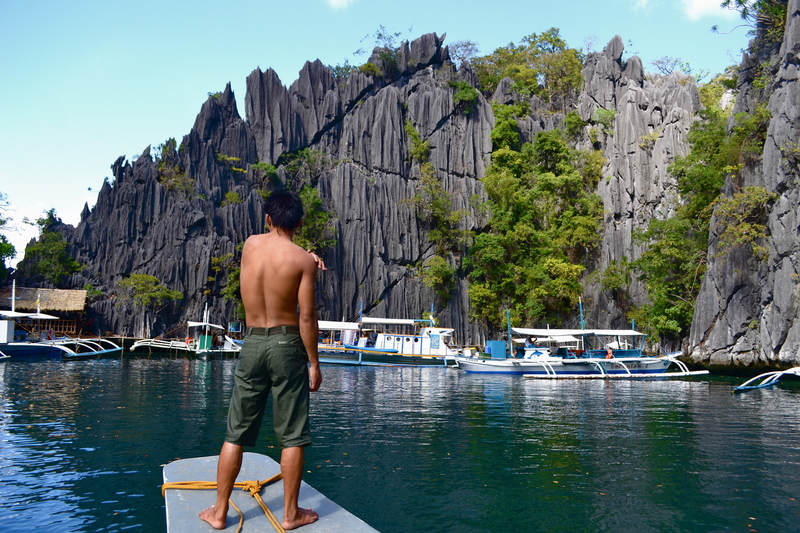 Our next destination was the famous Kayangan Lake. The view en route to the lake was fascinating with numerous rugged and irregular karst formation with green toppings amazing us to no end. 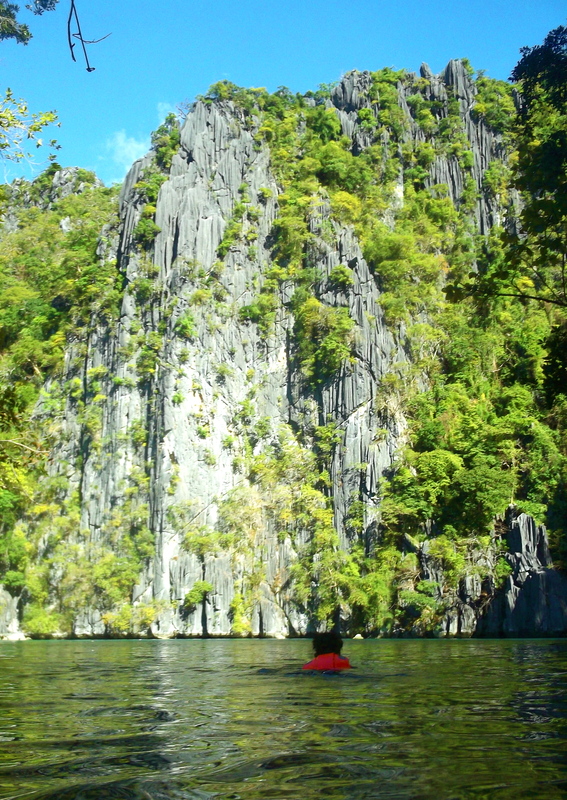 Indeed it was a scenery to die for everywhere we looked. 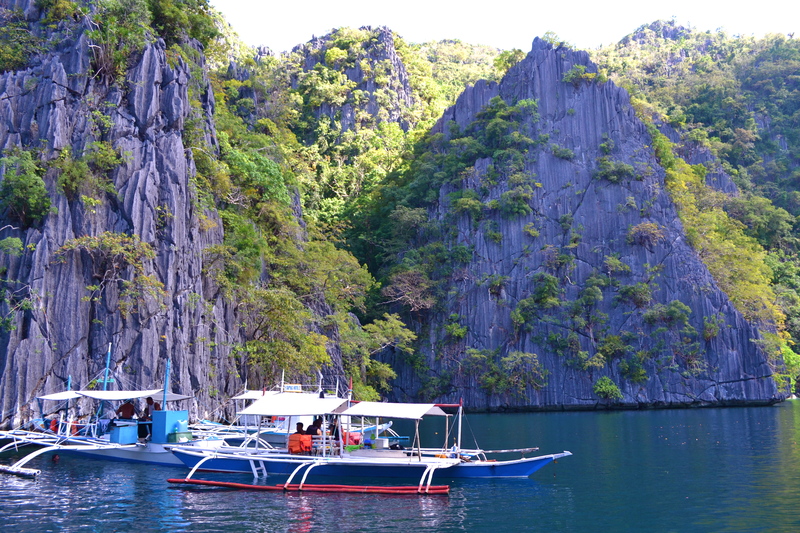 As we approached the entrance to Kayangan Lake, the view even became more serene, paradise-like and colorful. 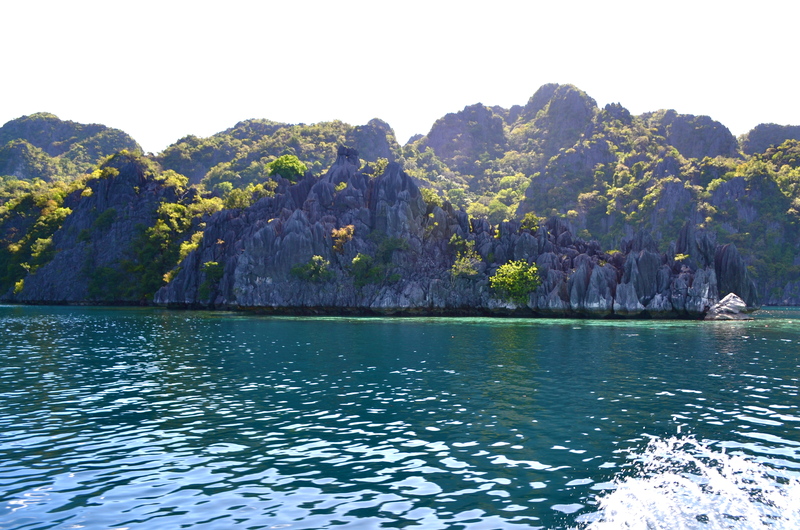 I wanted to get off the boat and just swim in the pristine, turquoise waters! 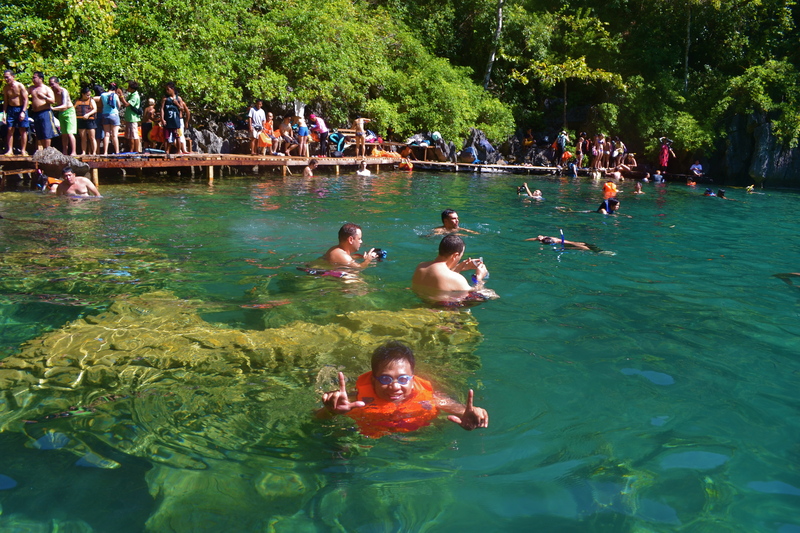 But it was not one of our destinations so we moved on to…..
…the docking station for visitors bound for Kayangan Lake. 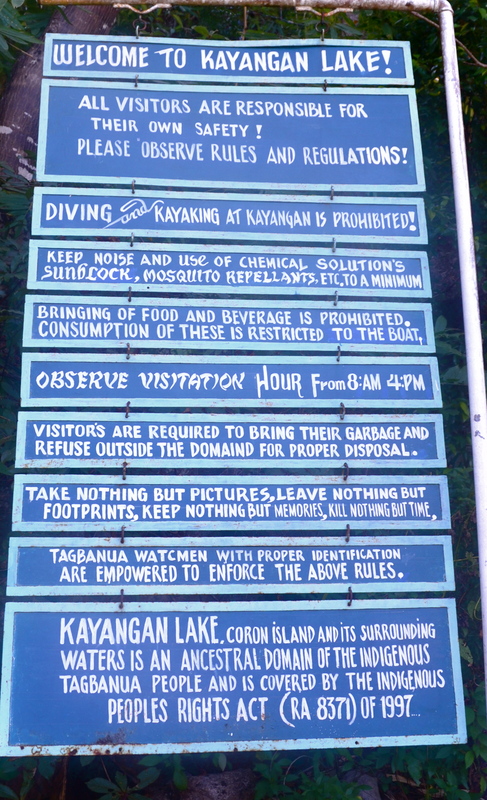 After we signed a waiver for untoward incidents, that we are completely responsible for our own safety, we climbed up the path to Kayangan Lake. 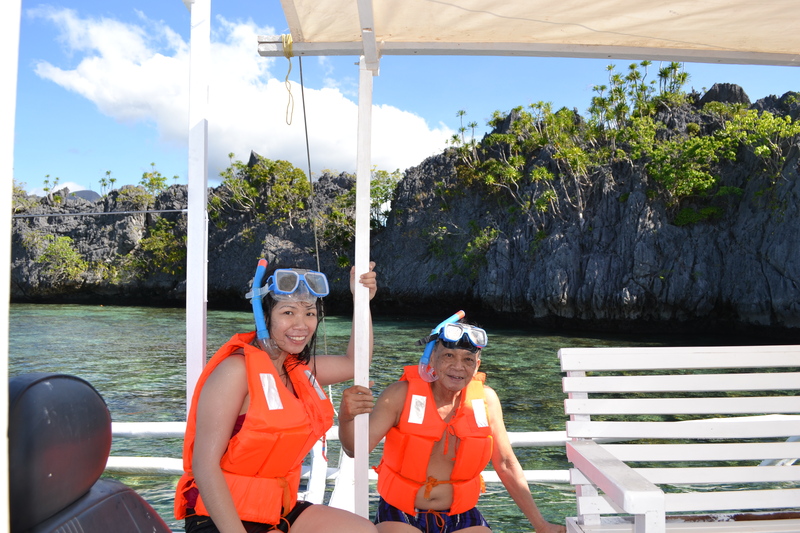 We had to take it slowly as my mom is asthmatic and she needed to rest once in while. 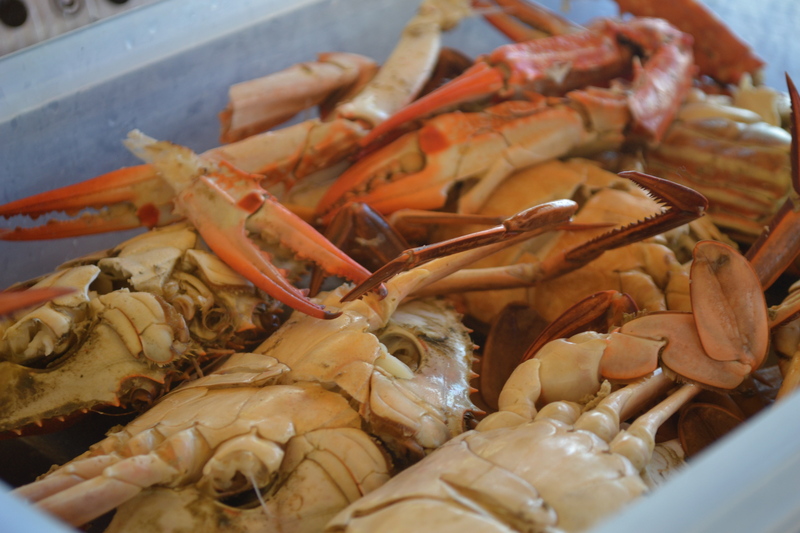 There were many visitors as it was Chinese New Year holidays. 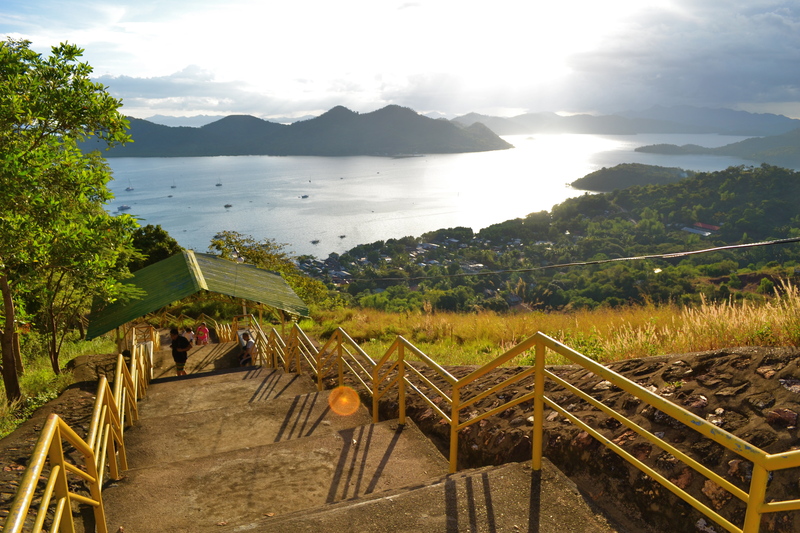 We reached the top of the hill and the climb was all worth it. 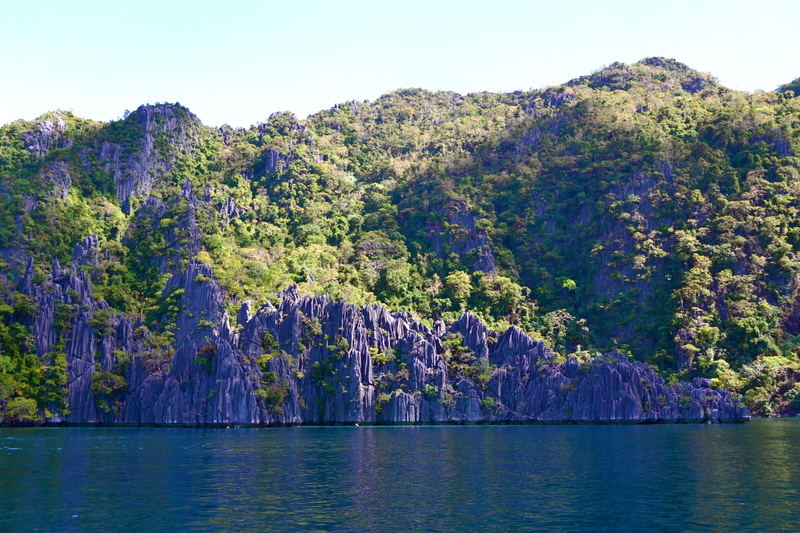 We were treated to the most picturesque view I have seen in years, an iconic view that is uniquely depicting Coron…it was not Kayangan Lake yet but just the waterway we passed through earlier. 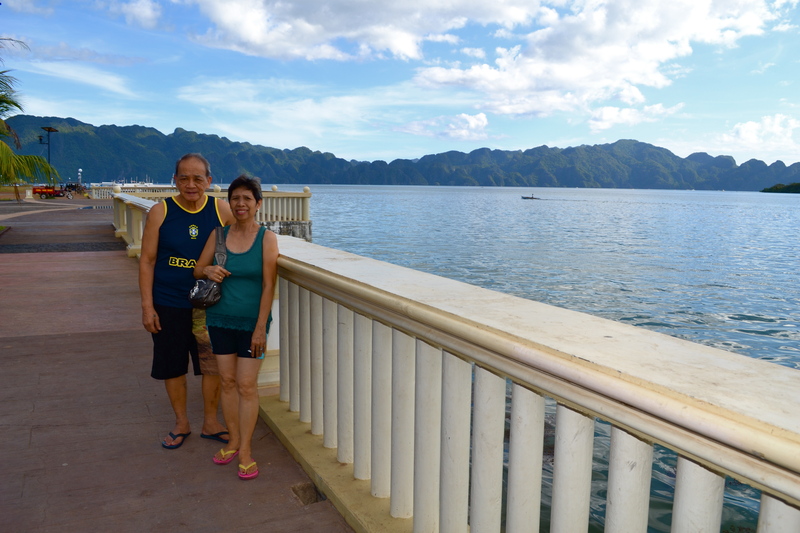 We had to queue up for that coveted shot with the stunning view as backdrop. 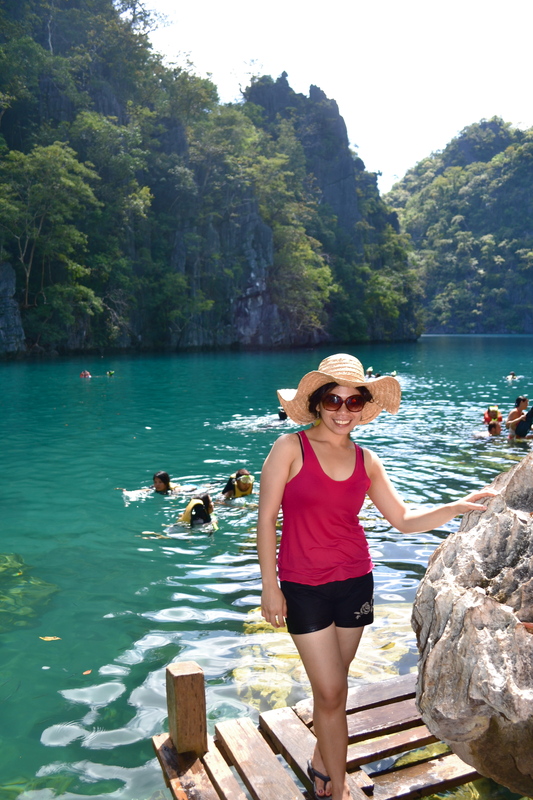 After the 15-min photoshoot, we climb down to the other side of the mountain and we finally reached the lake. 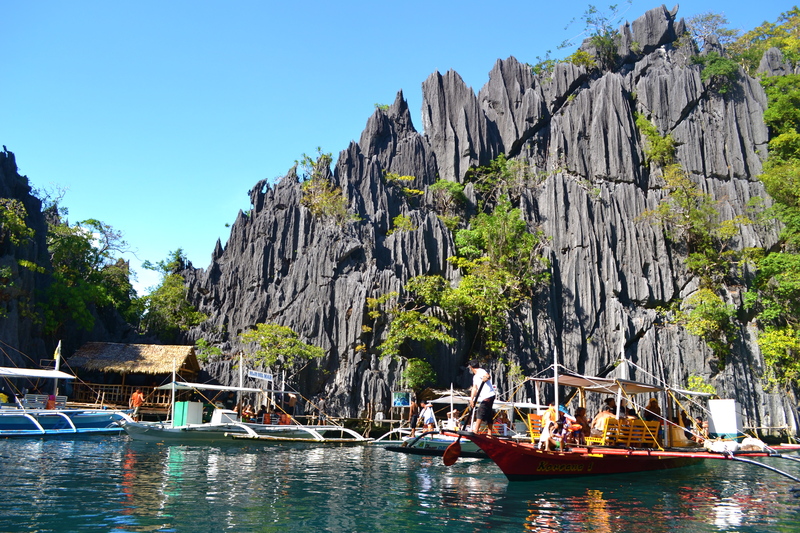 Kayangan Lake is under the care of the indigenous tribe of Tagbanua. 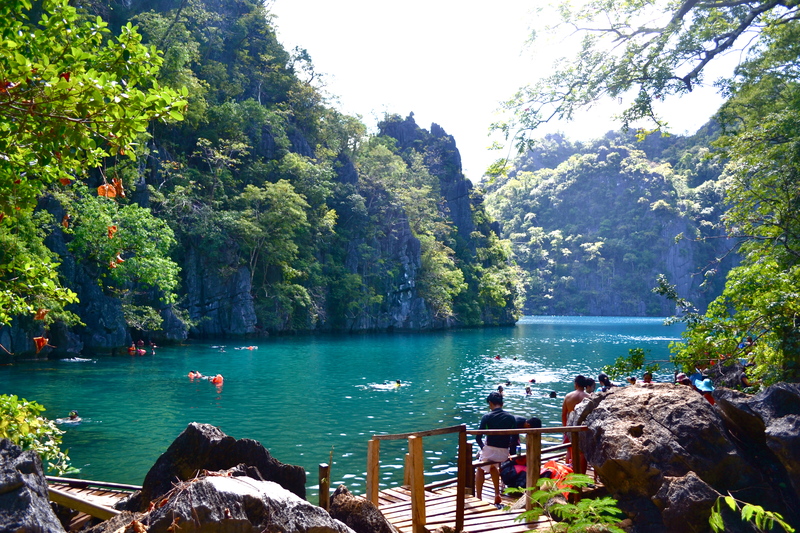 This is the only one of the many lakes around Coron open to public as others have been declared sacred or dangerous by the tribe. 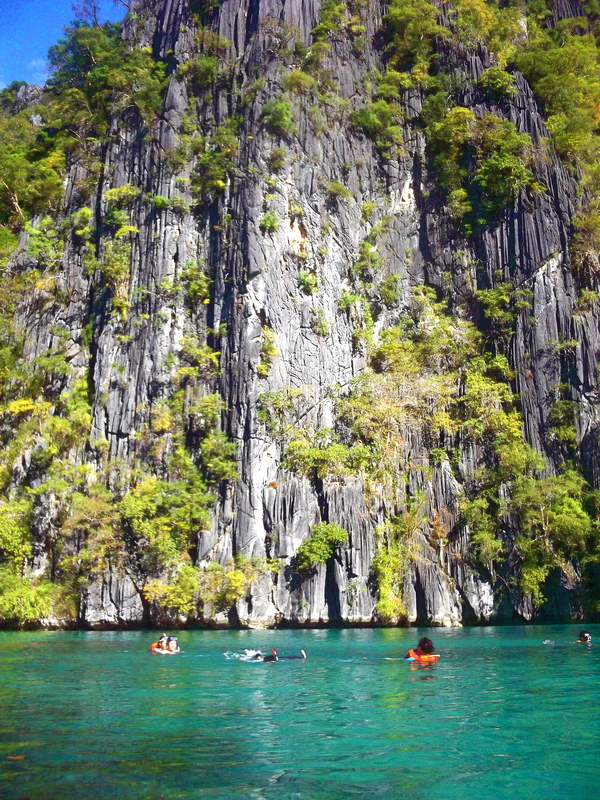 Kayangan Lake is now officially the cleanest lake in Asia. The visibility was an unbelievable half a mile deep! 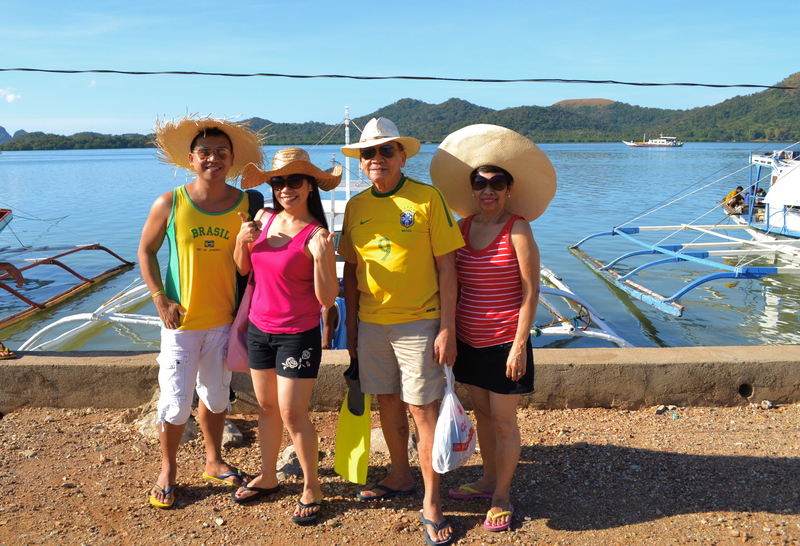 Before we dived into the clear waters, we posed for some shots at one of the banks. 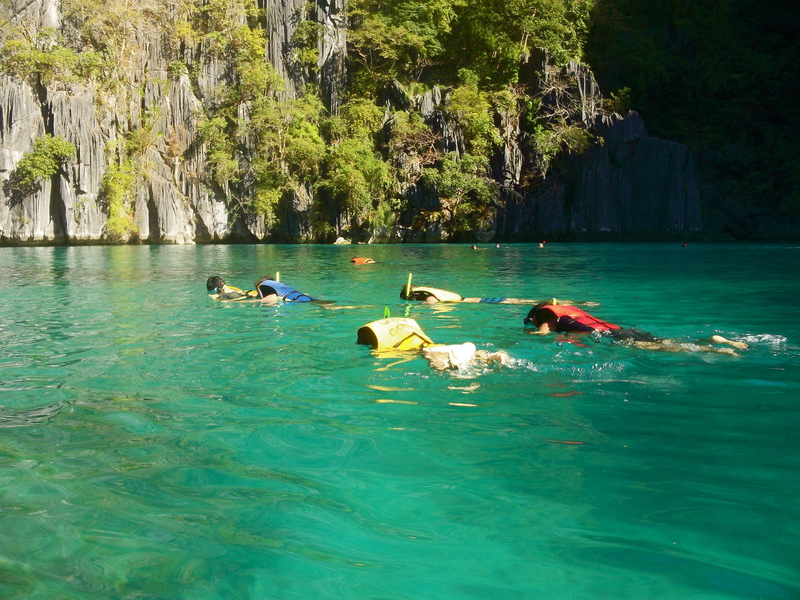 The lake was pretty crowded that day due to a great influx of local and foreign visitors spending their Chinese New Year holidays in Coron. 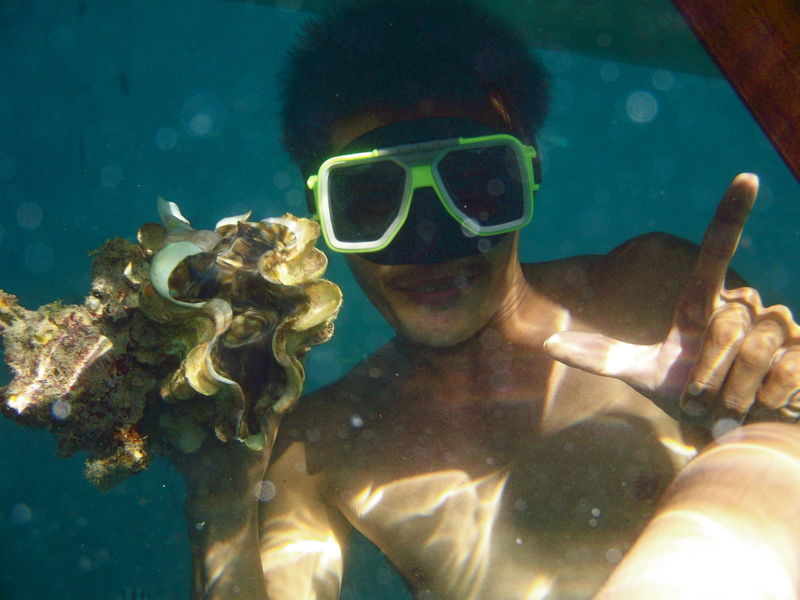 But under the water it was not crowded. 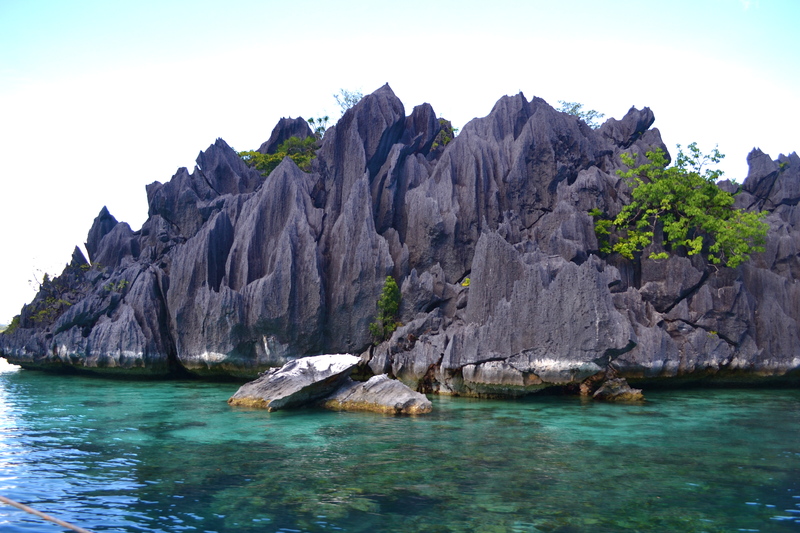 I managed to defy bouyancy with my life vest on and sank for a moment for a shot with the clear underwater scenery of spiked granite stones. 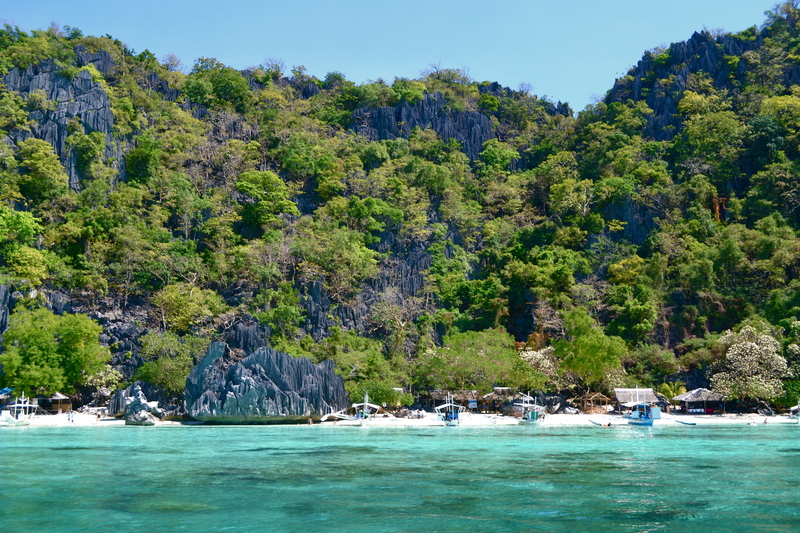 We left after an hour for our next destination where we would be having lunch, an island off Coron Bay having a stunning beach amidst limestone cliffs. 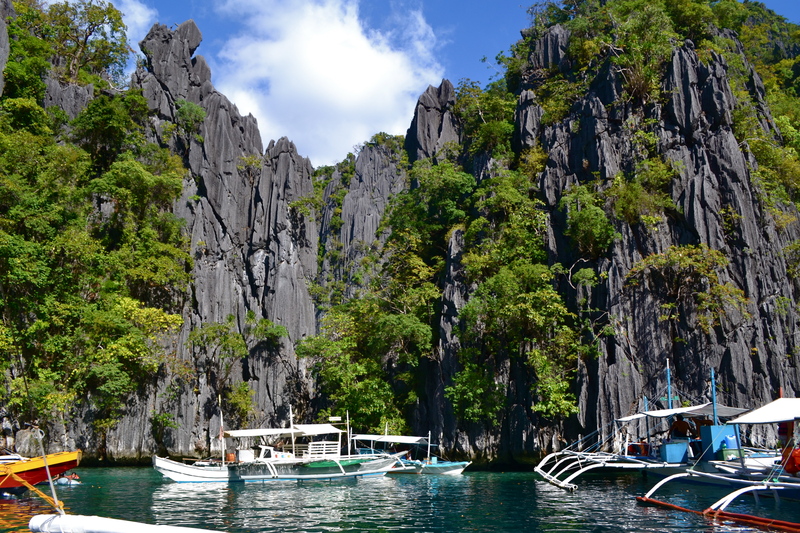 Once again the scenery remained Jurassic-like. 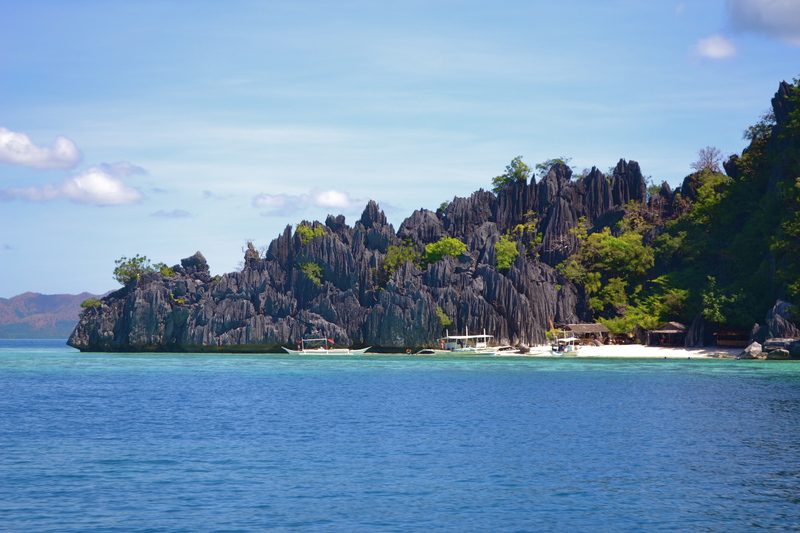 Endless karst formation adorned the islands. 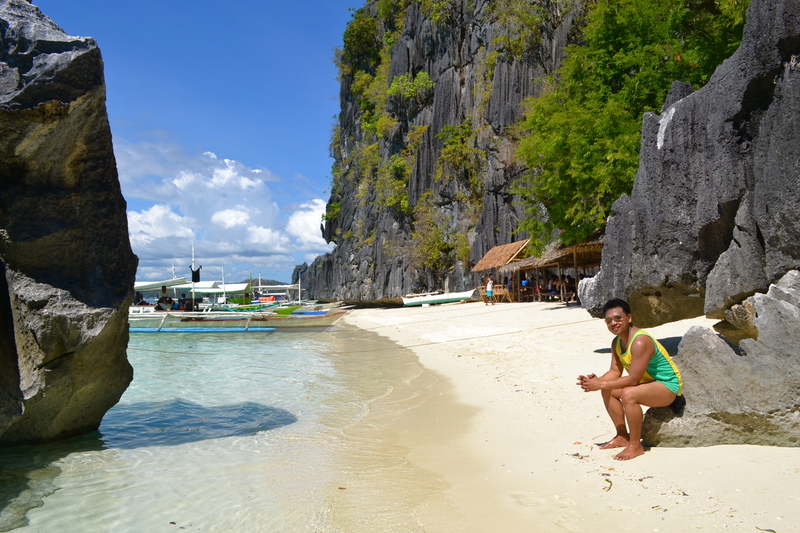 Even more stunning were those limestone cliffs with white sandy bays beneath them. 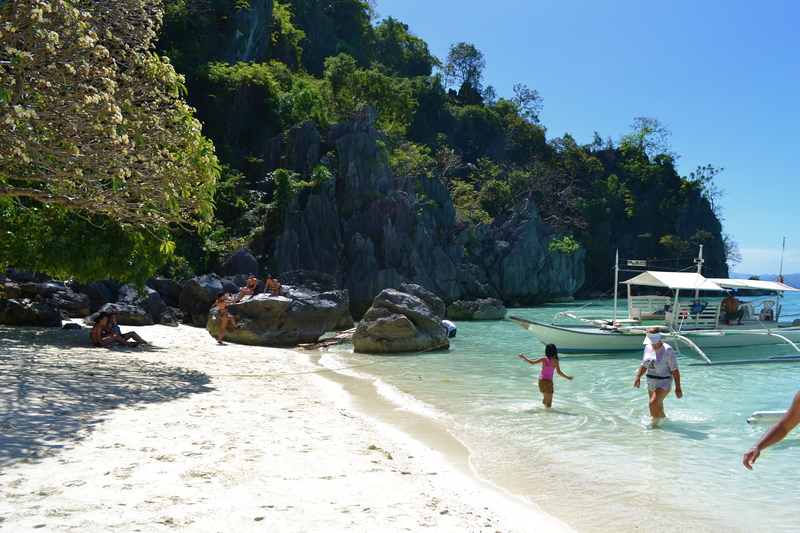 One of those beaches would be our stop for lunch. 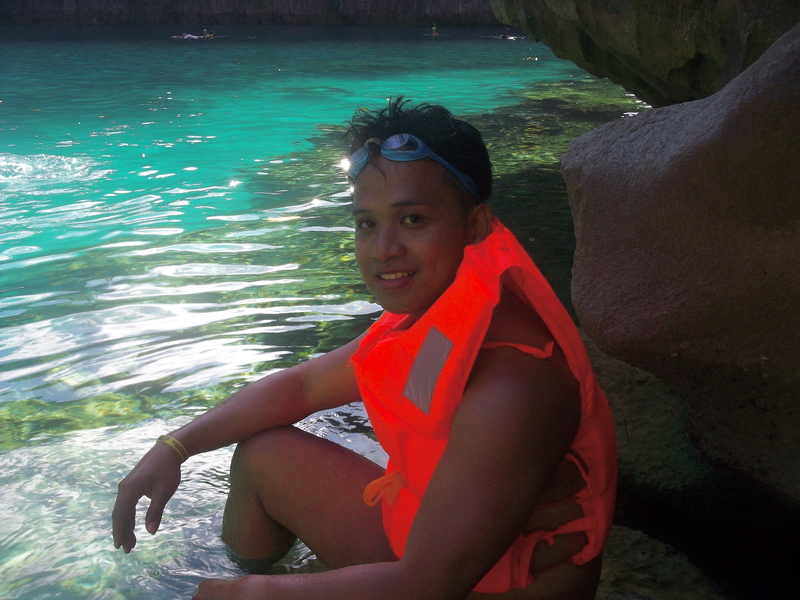 Amazingly clear waters attracted my camera lens again. 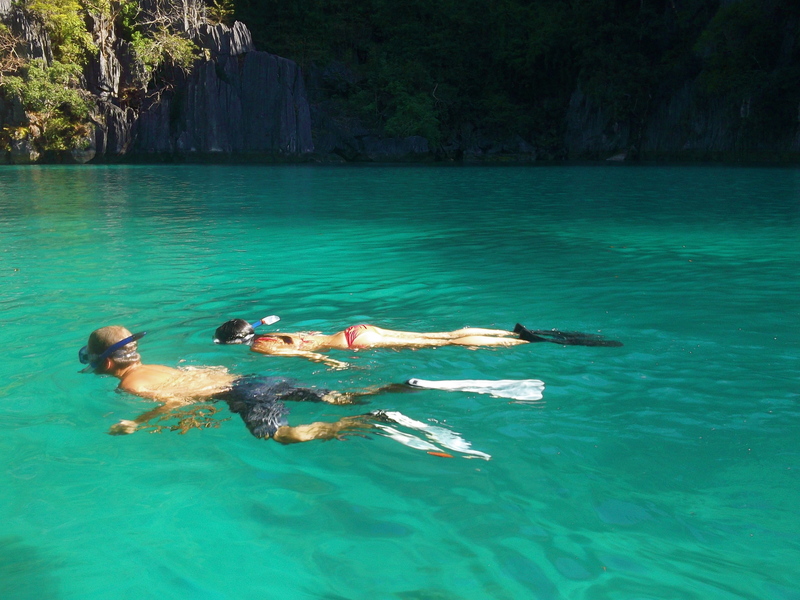 I have never been so impressed with seawater this clear. 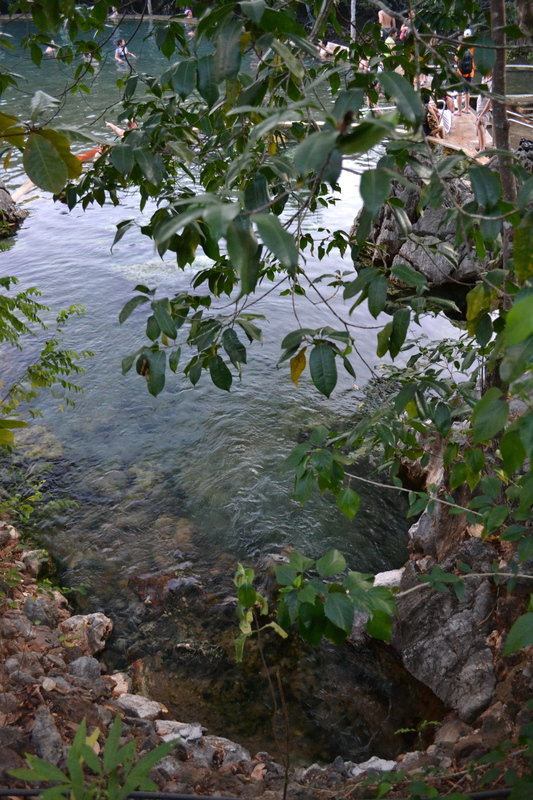 As we neared the shore the water was even more amazing. This was indeed overwhelming! The beach where we would have lunch. 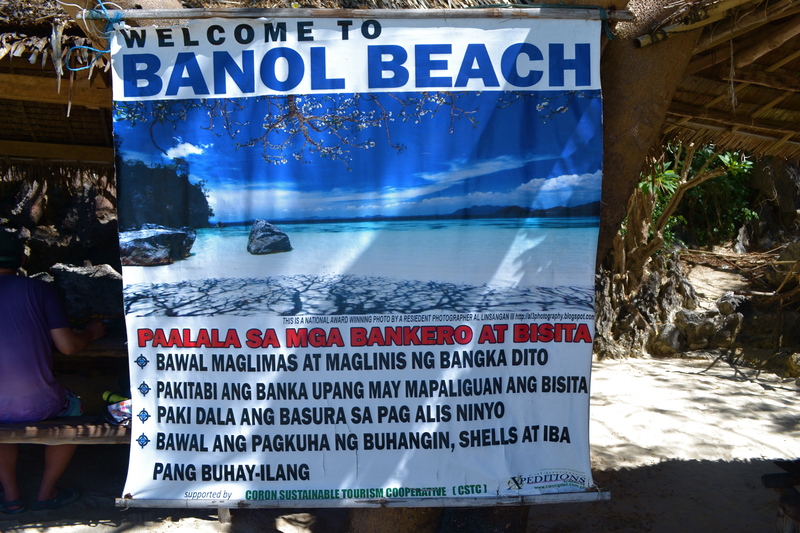 Welcome to the beautiful Banol Beach! 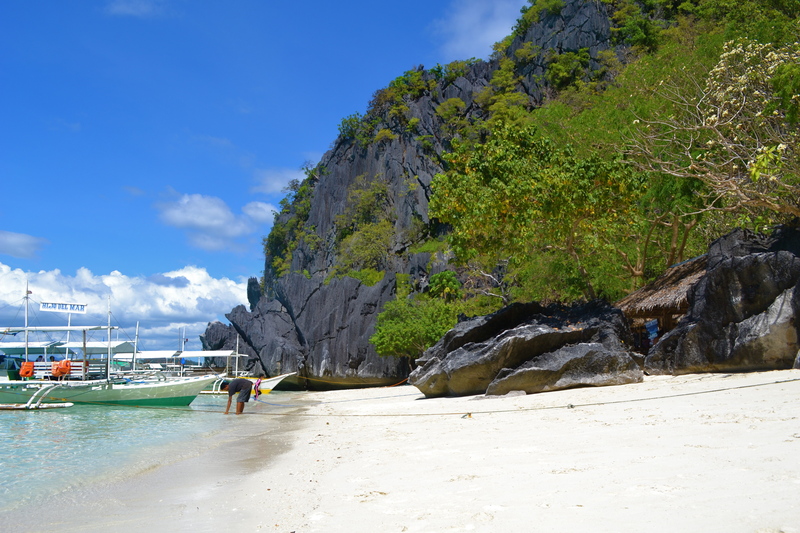 A nice beach indeed to laze on a sunny afternoon. 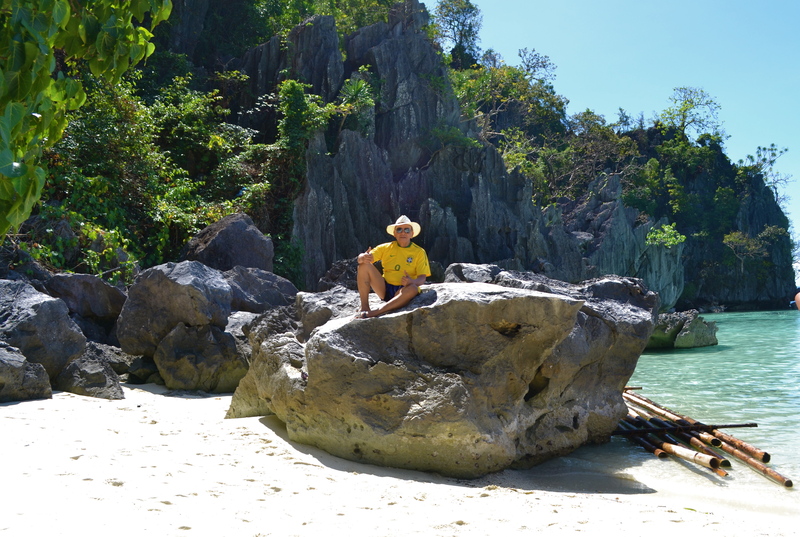 At one end of the beach was a huge limestone formation dividing the beach. 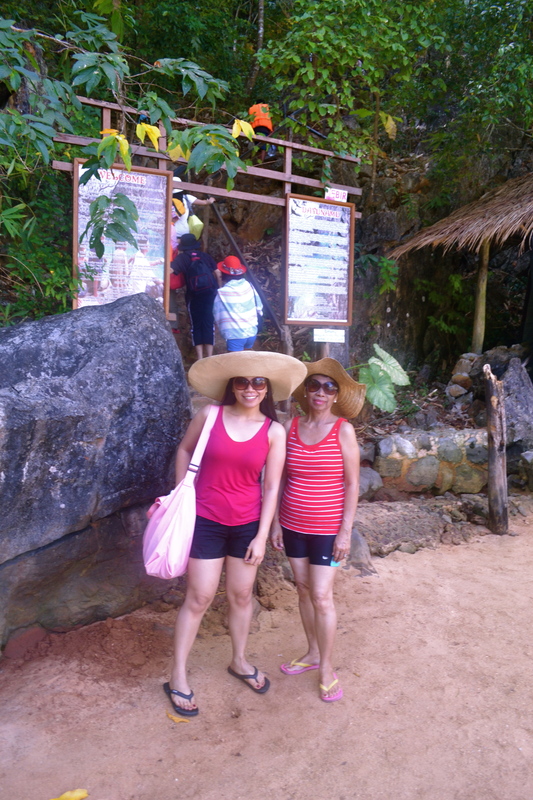 We went through a small passage and reach the other side of the beach. This was the other end of the beach. We went back to the other side. 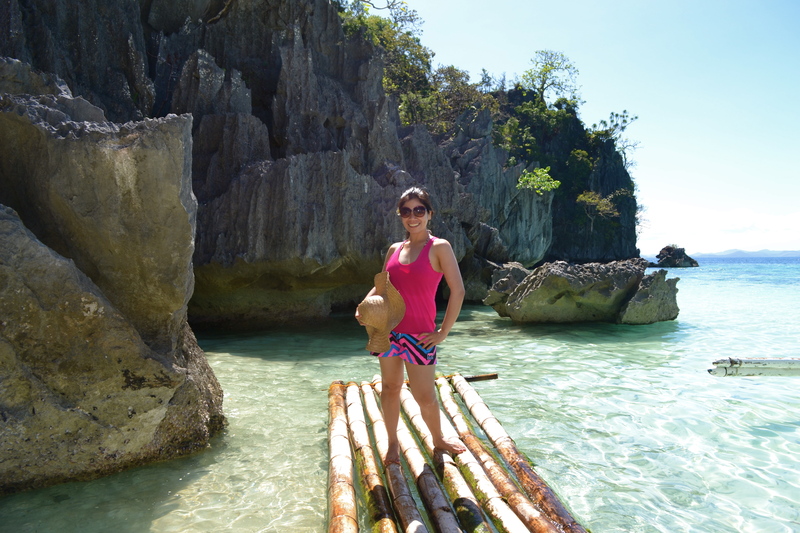 A bamboo raft was freely floating and we took photos at this area. 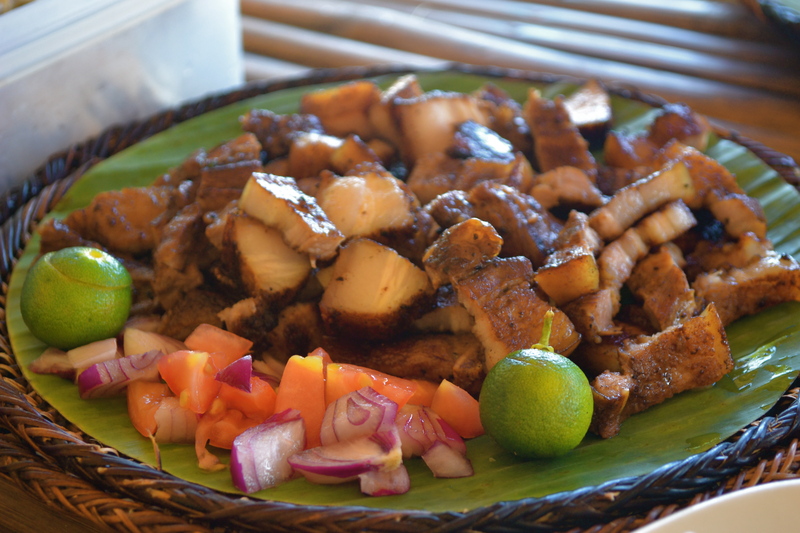 The sumptuous lunch was then served. 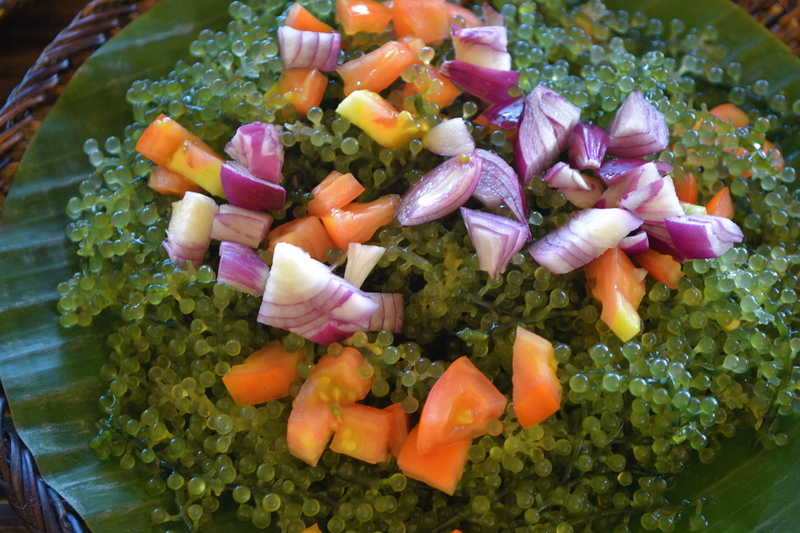 I loved the Philippine seaweed called ‘lato’. 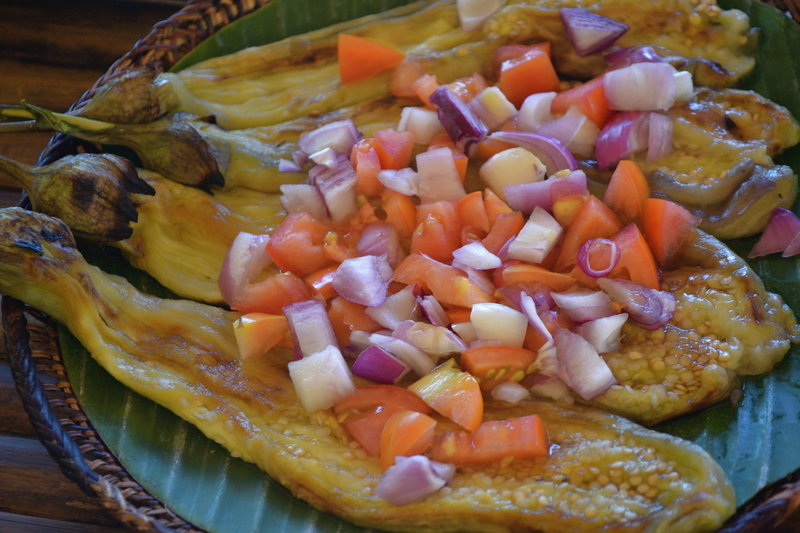 I have not eaten ‘lato’ for years! 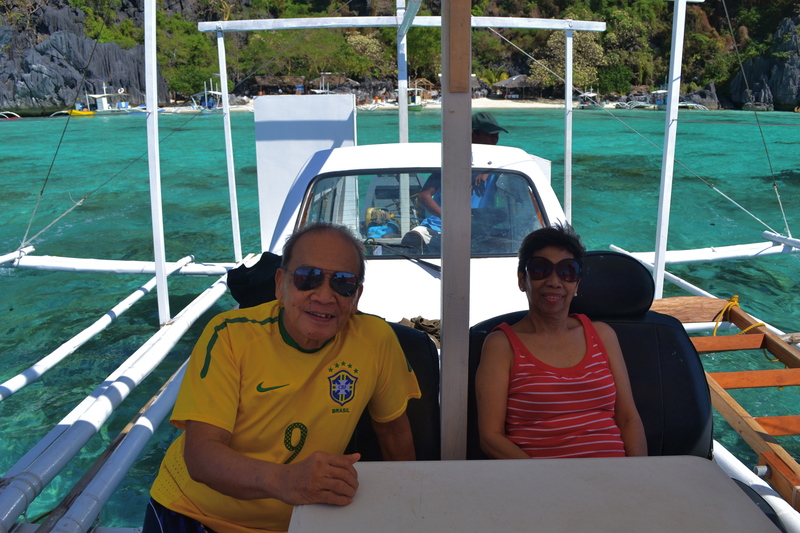 Indeed, my parents were enjoying our second day in Coron. 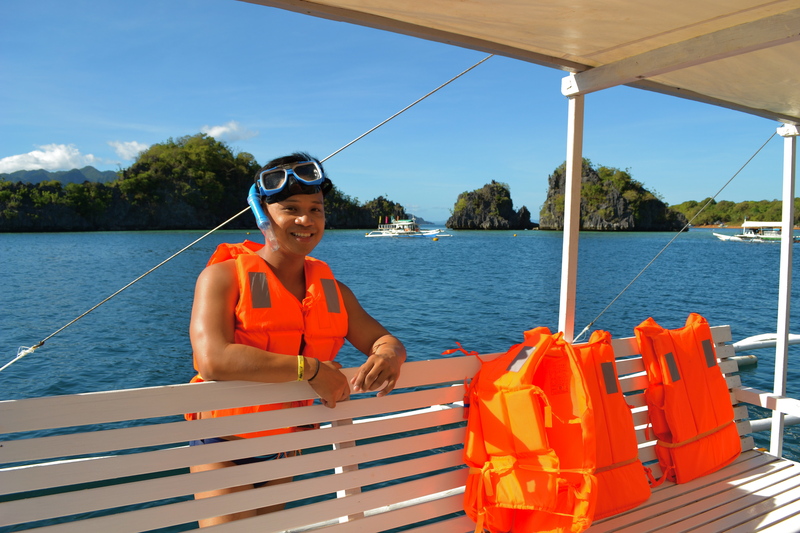 Too bad we had to leave afterwards for our next destination, the Skeleton Wreck, a famous snorkeling and diving site. We finally reached the seemingly crowded Skeleton Wreck. 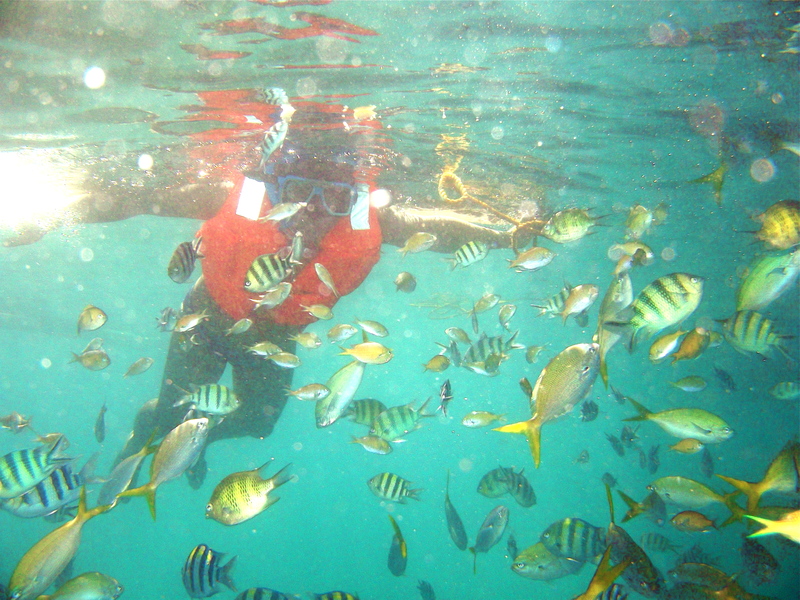 Once again my mother was assigned to feed the fish while the rest of us would snorkel. 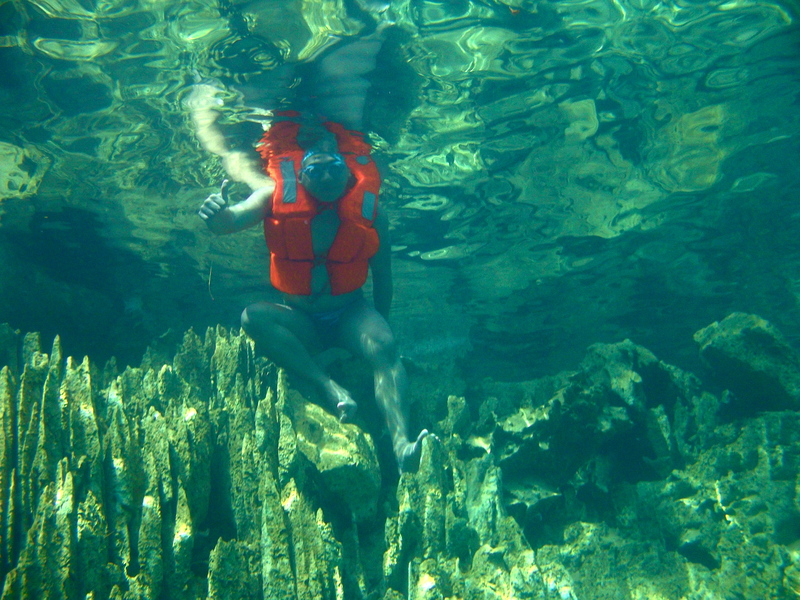 Our second snorkeling session of the day was better than the first. The colorful, live shells were bonuses. 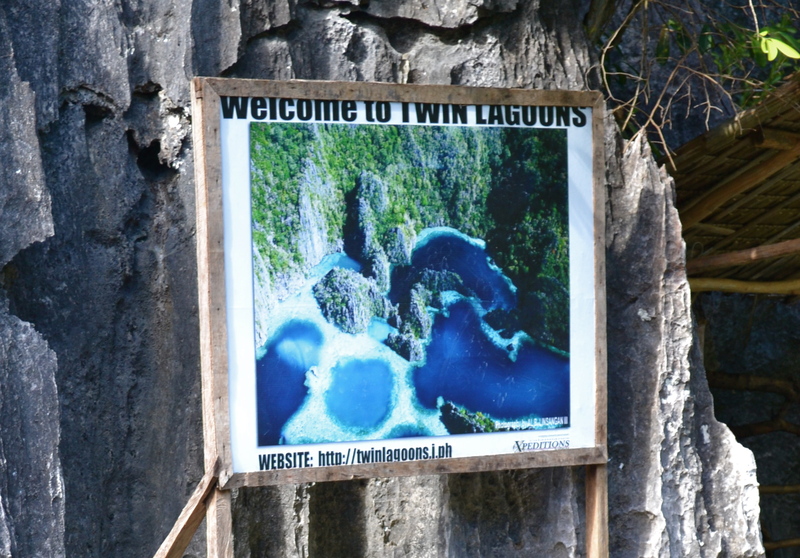 We spent 30 minutes there in the area and then we left for out last stop of the day, the amazing Twin Lagoons! 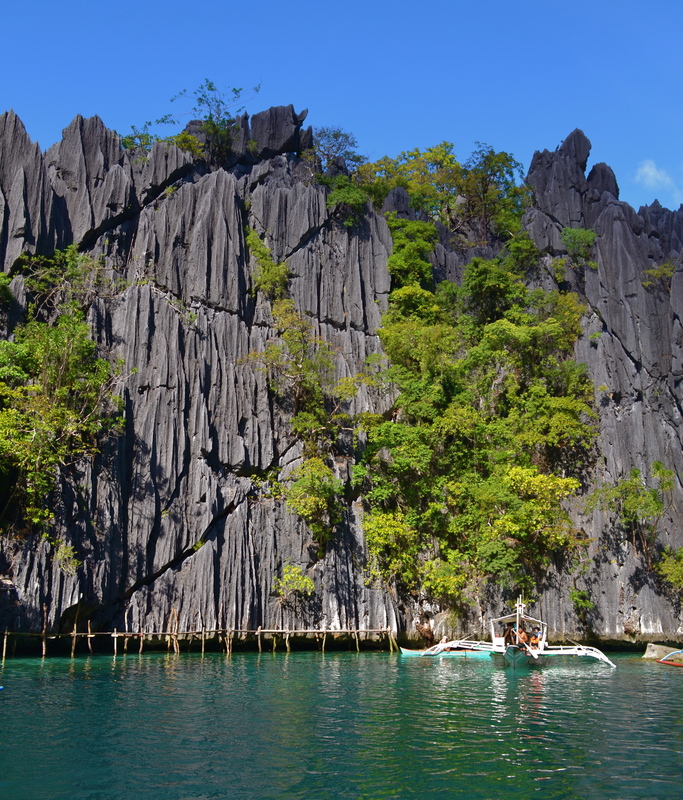 Oh those mid-sea karst formation once again. 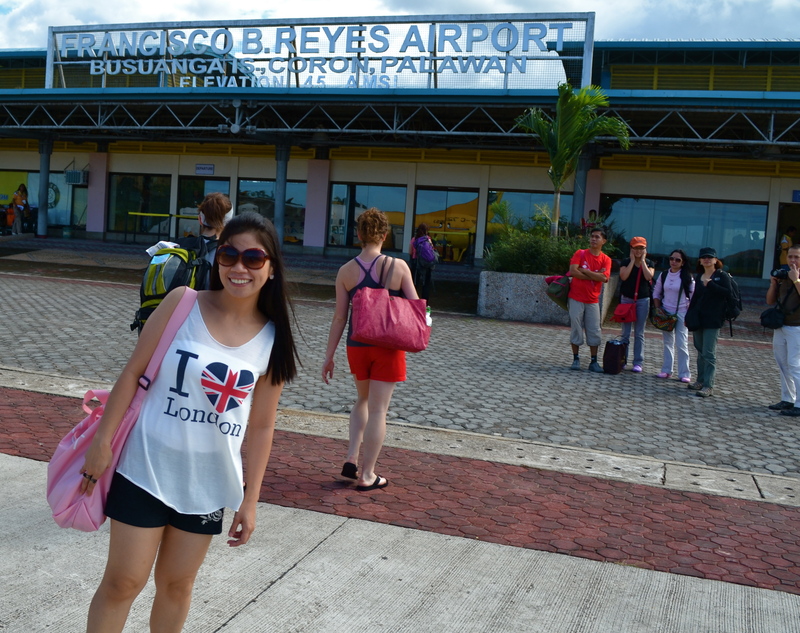 The arrival was absolutely breathtaking for me. 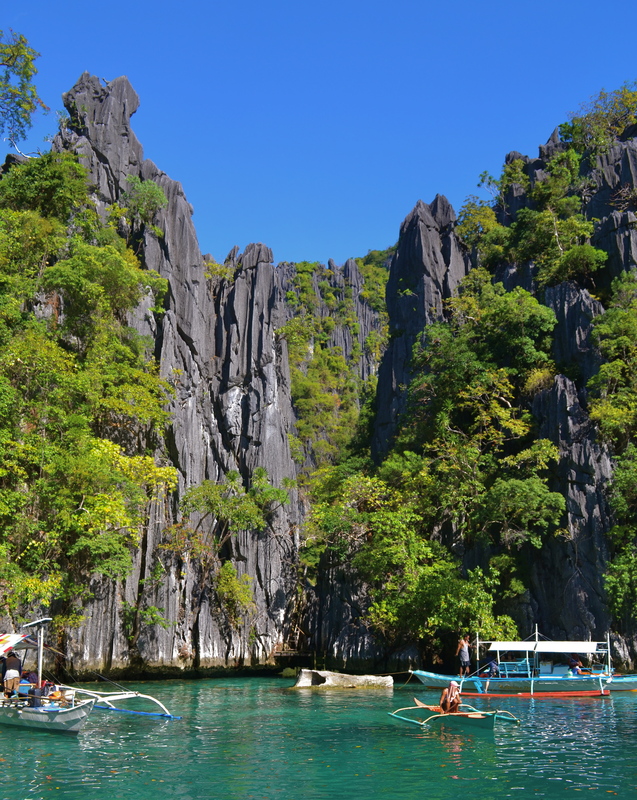 At the base of the center of those karst formations was the tiny entrance to the lagoons. 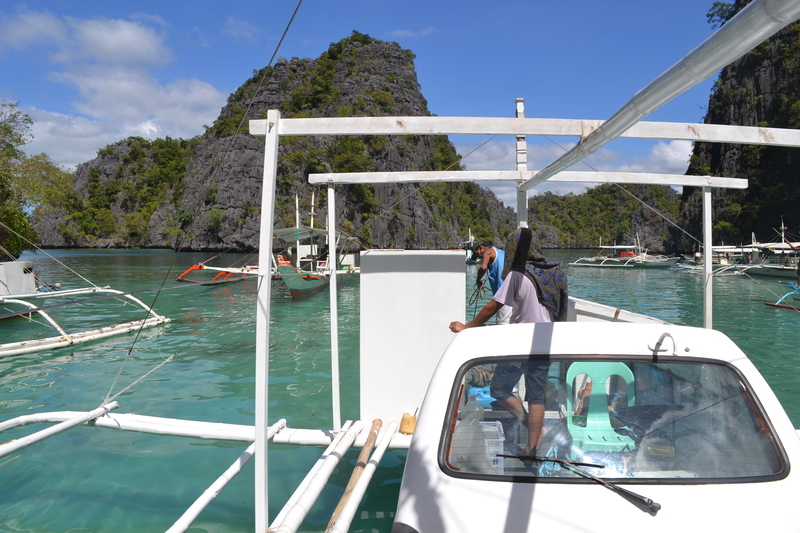 Our boat had to be positioned as close as possible to the entrance as we need to swim from the boat to the entrance. 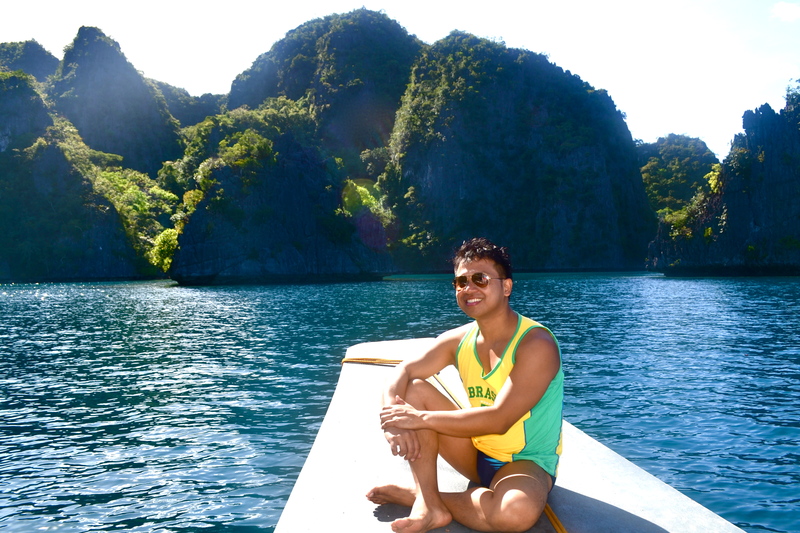 I could actually just stay in the boat and just me mesmerized by the stunning scenery. 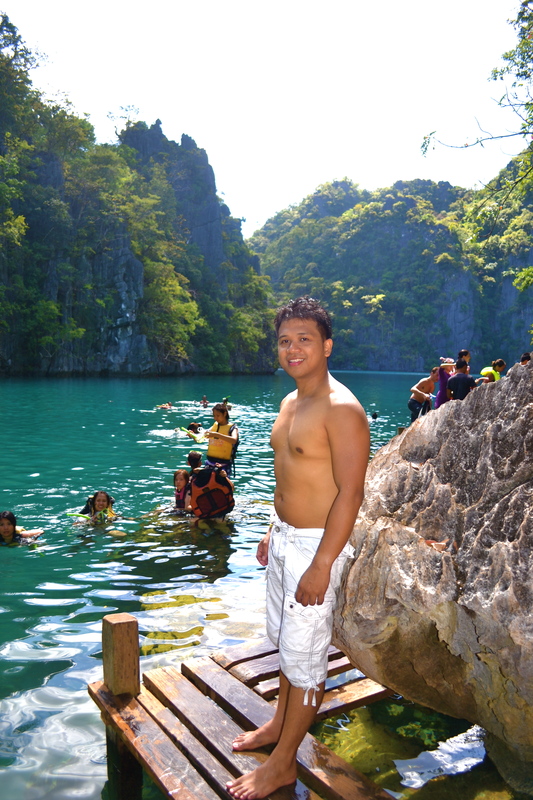 However, I had to get off the boat and swam with the two tour guides. 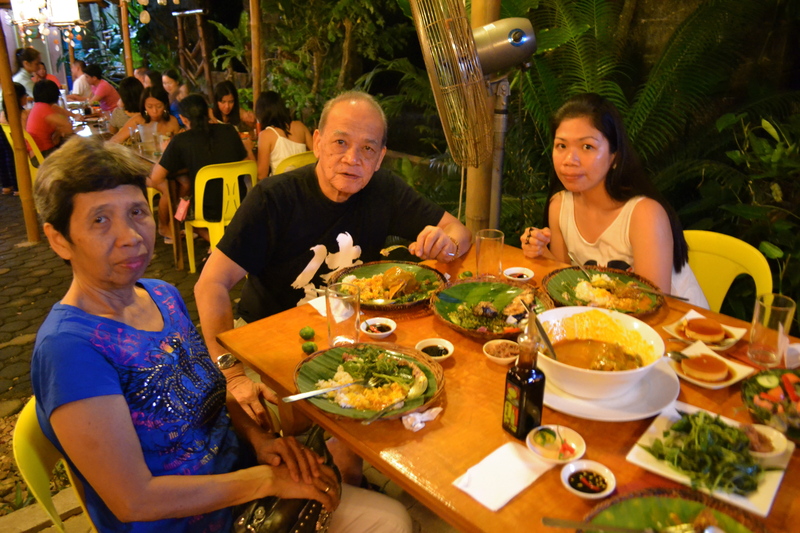 My parents and my sister were not interested to get inside. 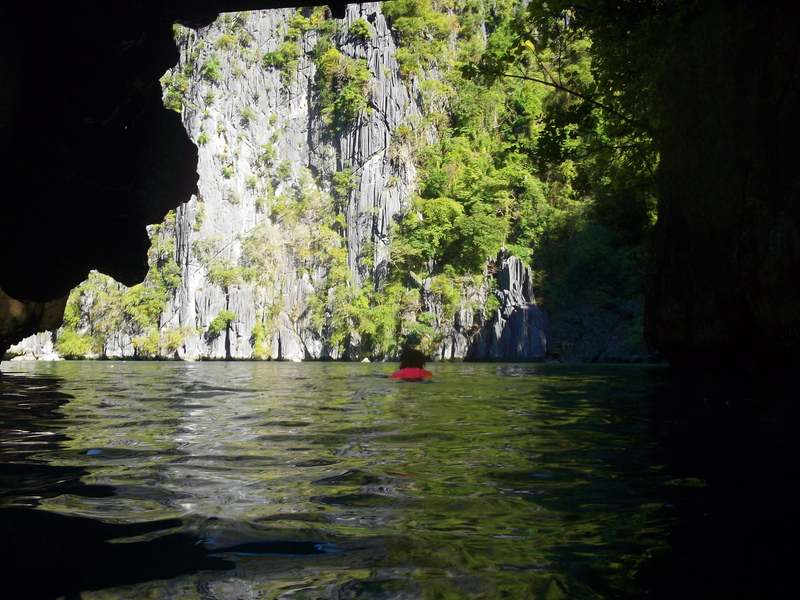 Thank God, it was low tide and we could pass through the tiny opening without any difficulty. When we got inside we were the only ones there. Then more visitors followed and the place suddenly turned from deserted to crowded. 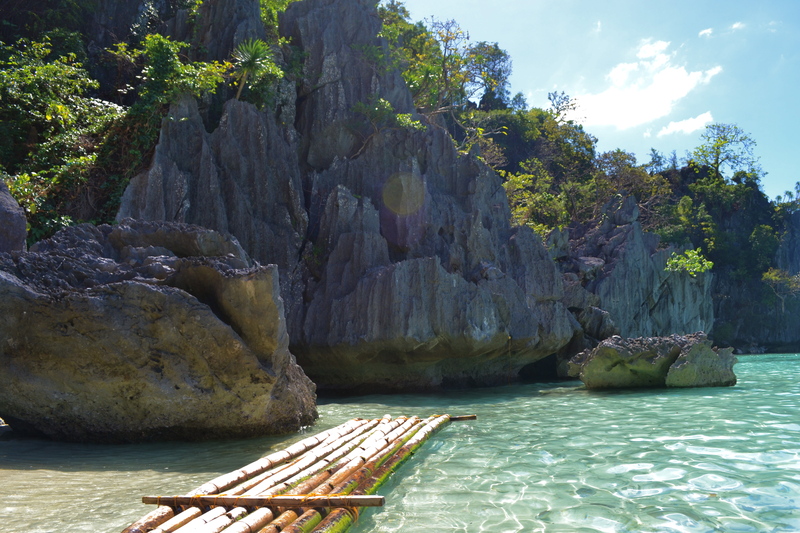 As the last destination of the day, it was worthy of a thumbs up. 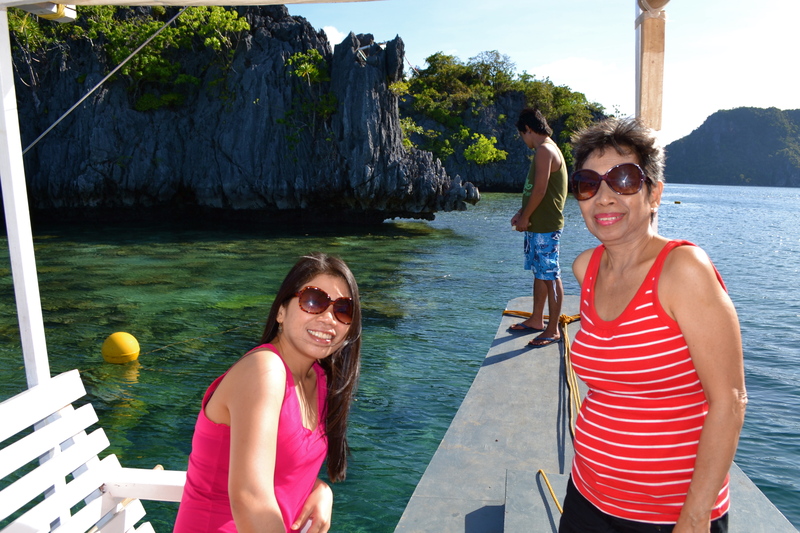 We rested for a while on some rocks…..
…watching people passing us by. 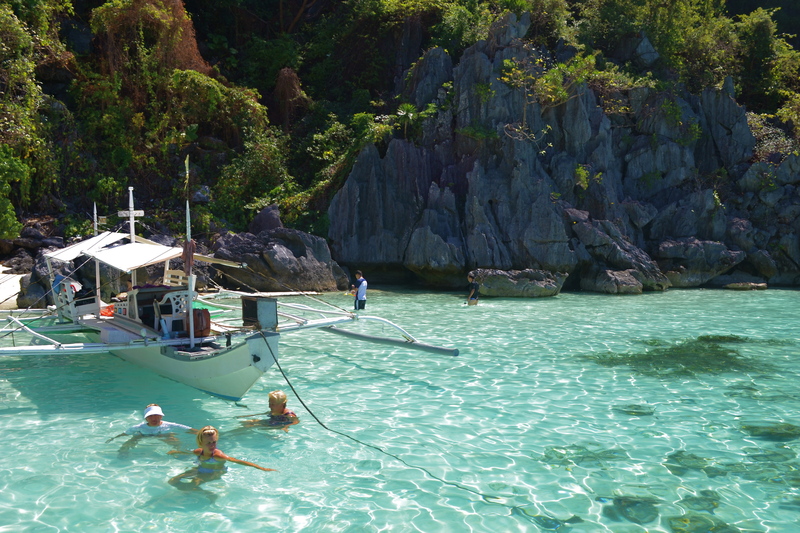 The calm, turquoise lagoon water was indeed a great sight to behold. I could say this was the highlight of our trip. 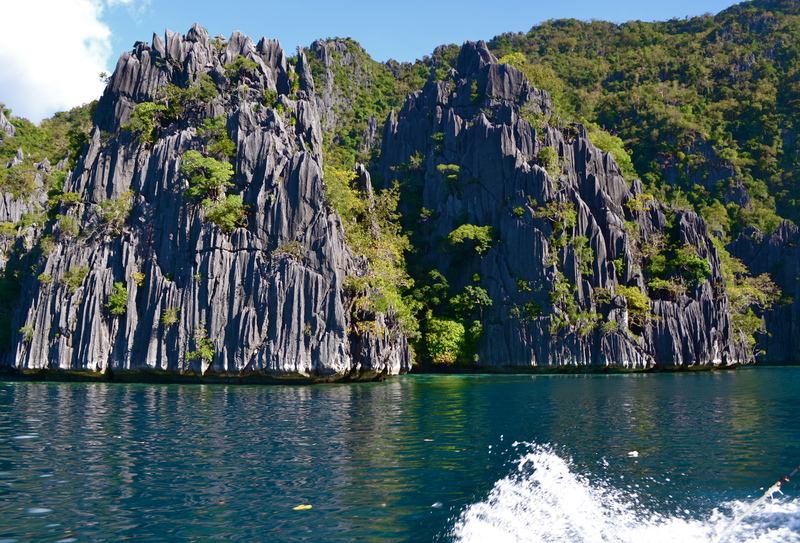 The stunning limestone formations blew me away. 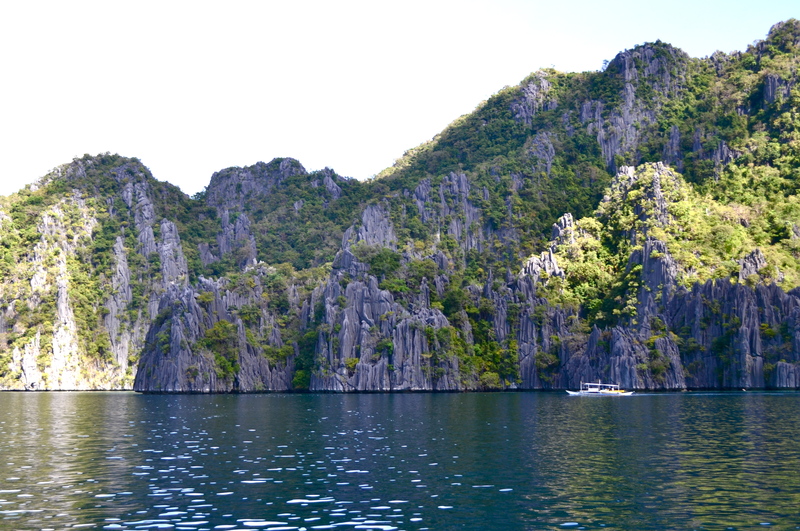 As we left we saw more karst formation. 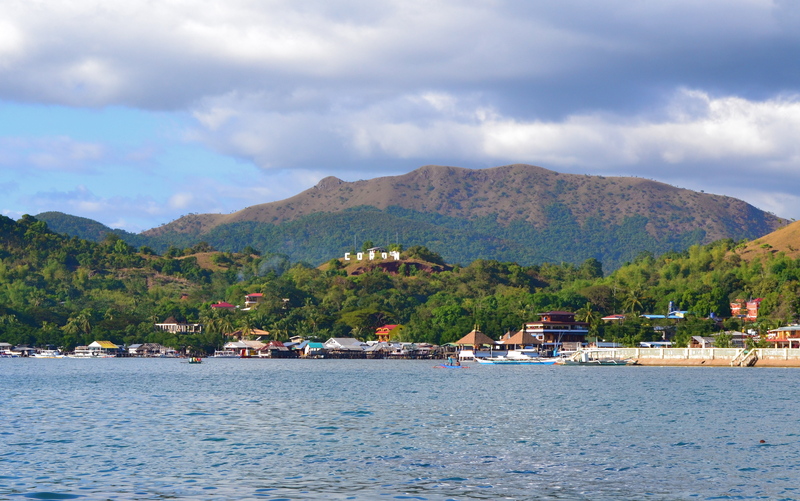 We reached Coron mainland just before dusk anticipating for the next day’s trip to more of Coron’s outlying islands and its lovely beaches. 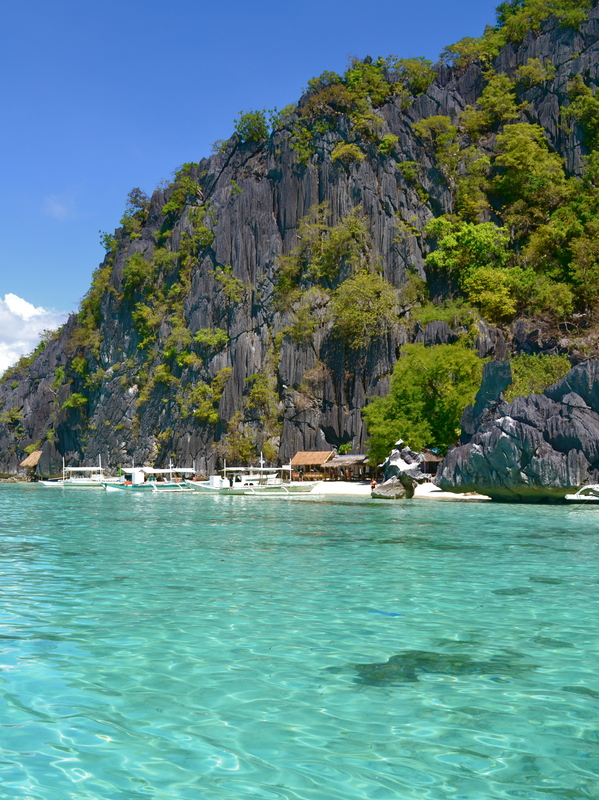 Click here to catch a glimpse of the stunning beaches of Coron. I’m almost teary-eyed in envy. 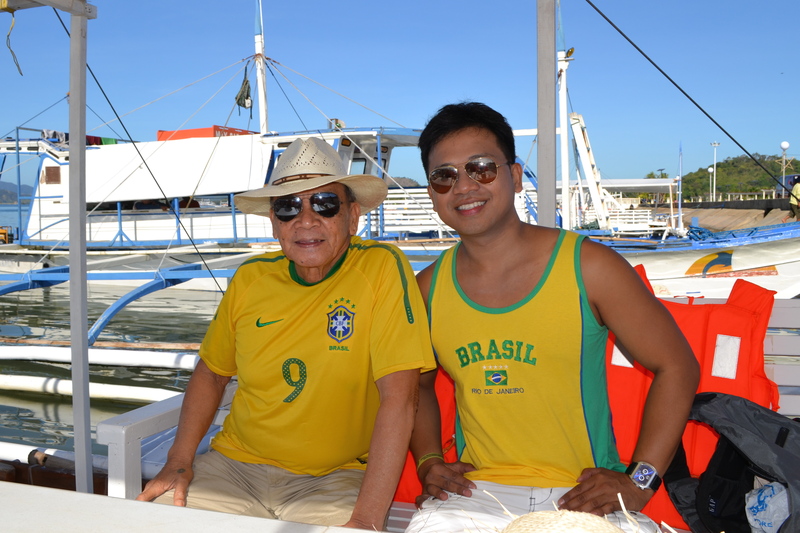 The week after this year’s holy week, we should had been there. Schedule conflicts so we cancelled the trip. 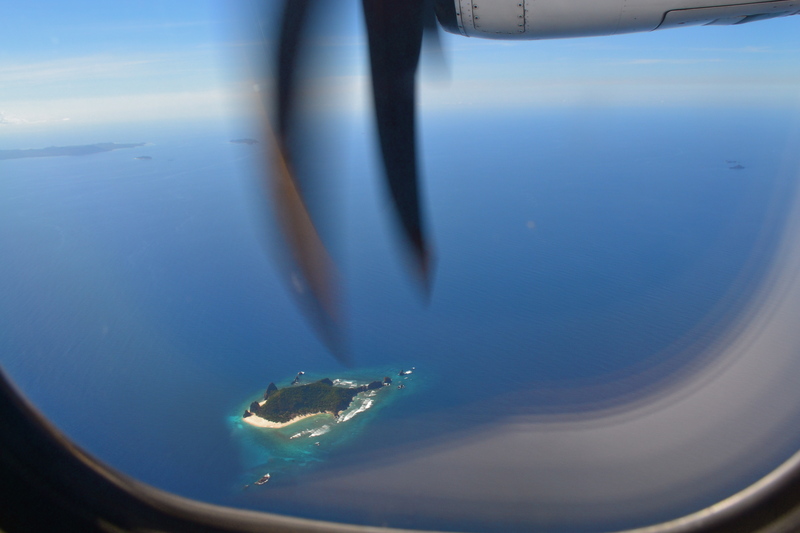 That’s 12 plane tickets gone! Huhuhu! Very nice pictures! Hi, sorry to learn about your cancelled trip. You can just try again. 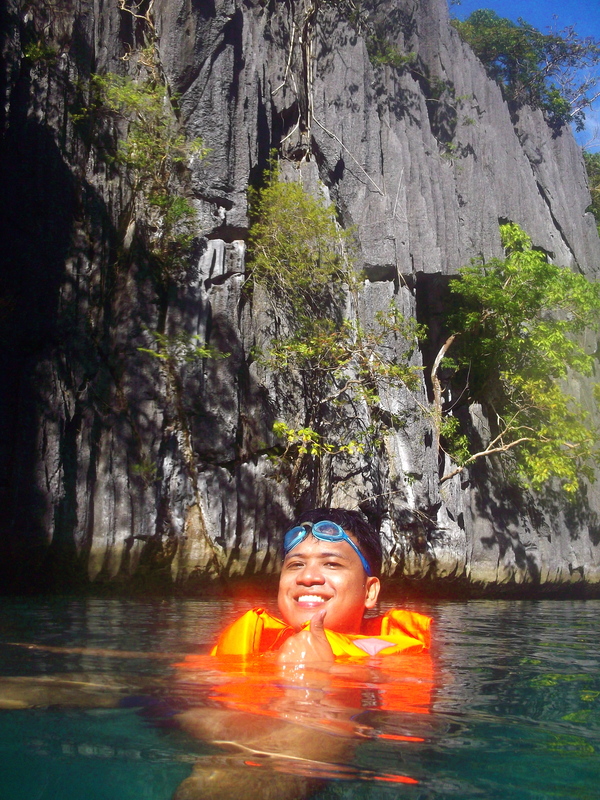 You must not miss Coron! 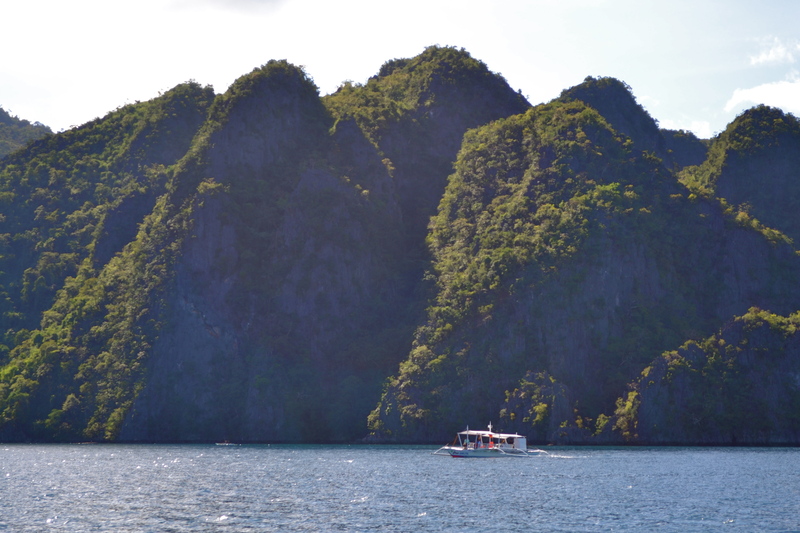 After Coron, I went to El Nido and they are both amazing places! Hi! 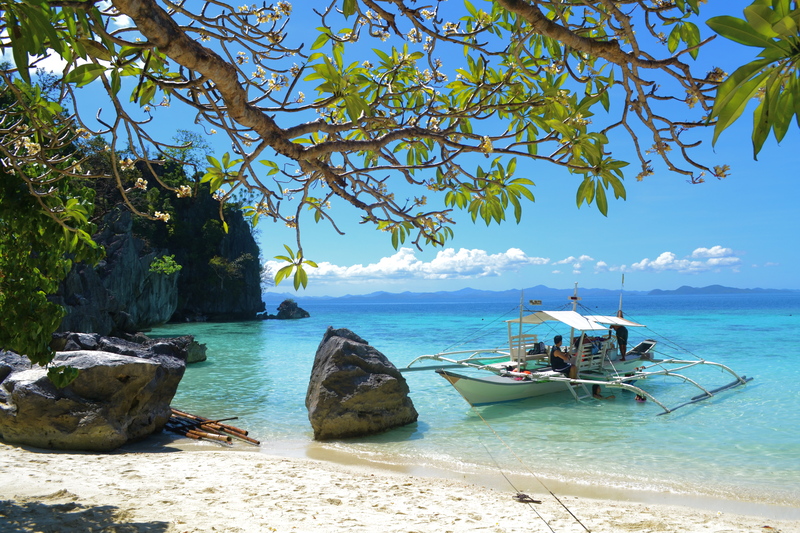 I just came across your page and it really got me so excited as my family and I are planning to travel to Coron this coming June. I just want to ask, what camera did you use to take those stunning photos? 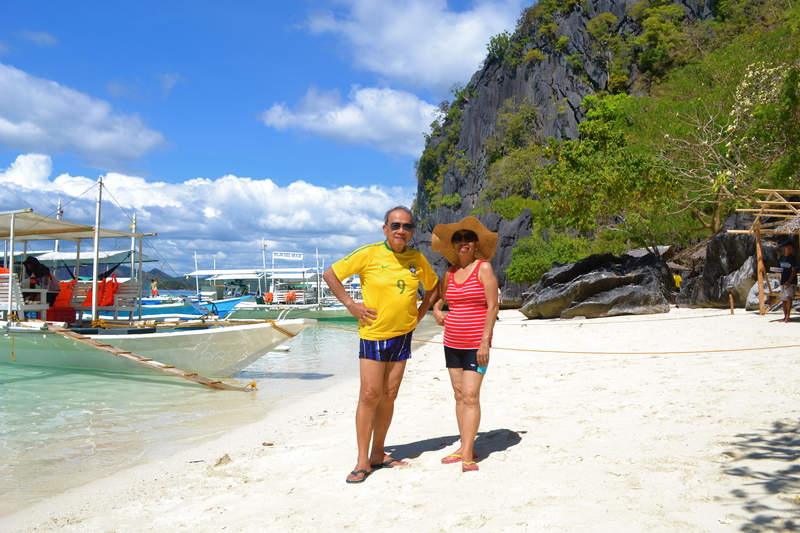 This is our first family trip to Coron so as much as possible I don’t want to miss out a single opportunity to take photos – awesome photos 🙂 Would be grateful to hear from you soon. 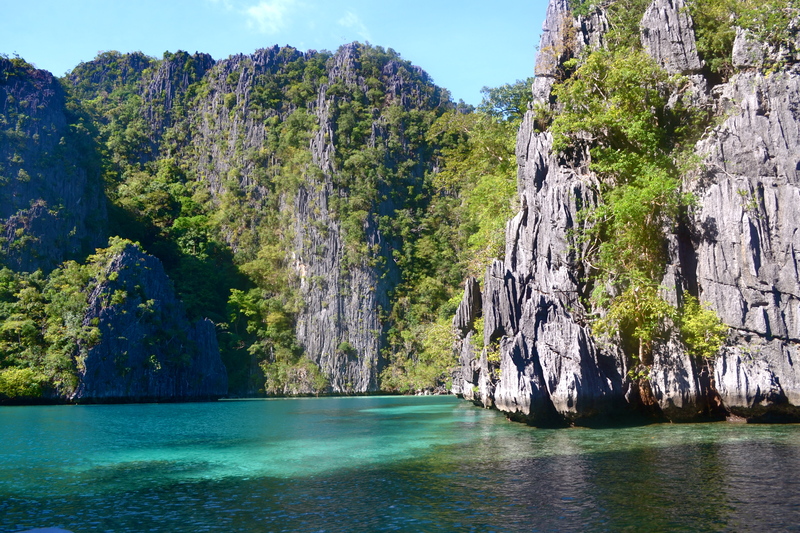 I’m planning an itinerary for our family’s Christmas vacation and am torn between Cebu/Bohol and Coron. 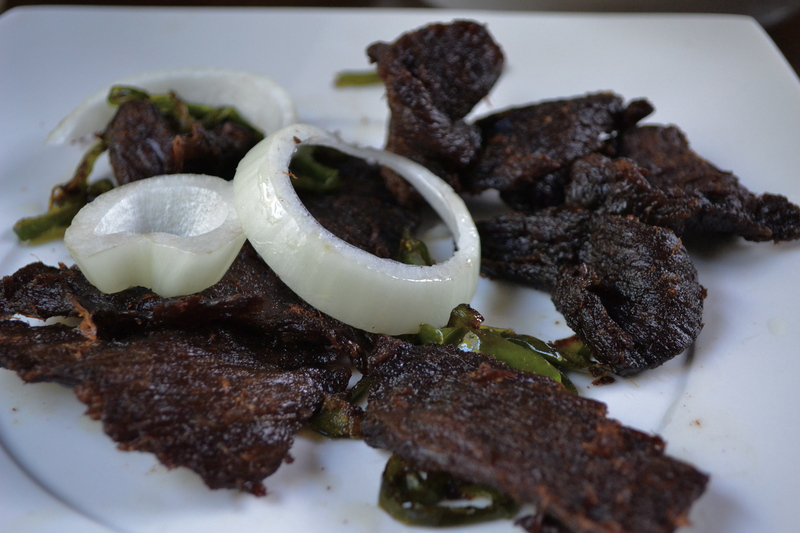 This blog post may have just convinced me to go with the latter. 🙂 Great pictures! Thank you! 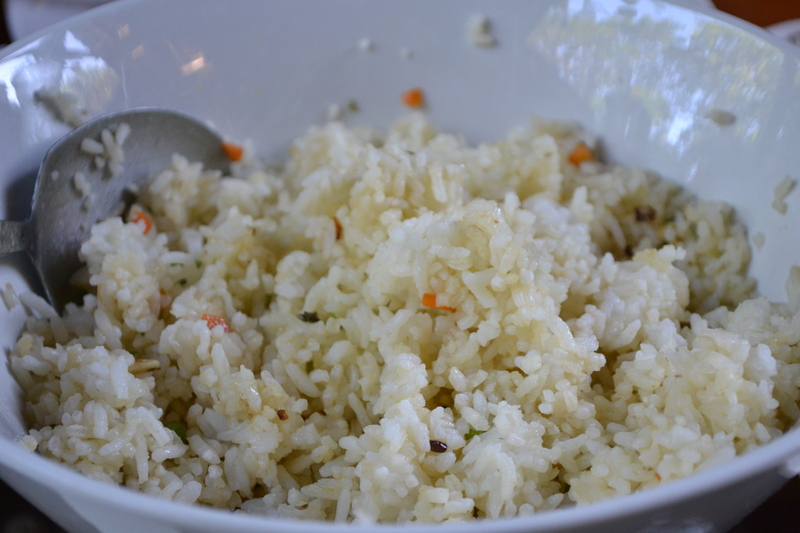 If there is anything you want to ask you can message me here or email me at eaniban@yahoo.com. Have a great trip!